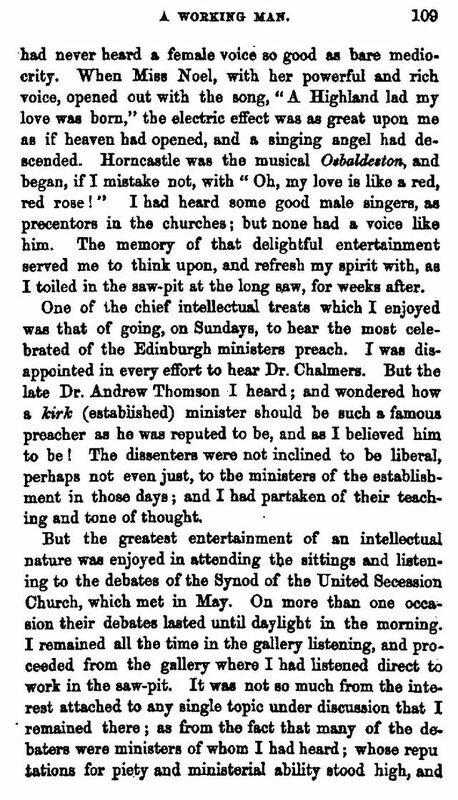 May we at A1History, once again, thank Dunbar's author Roy Pugh for the following enlightening precis of Mr Somerville's fascinating life. 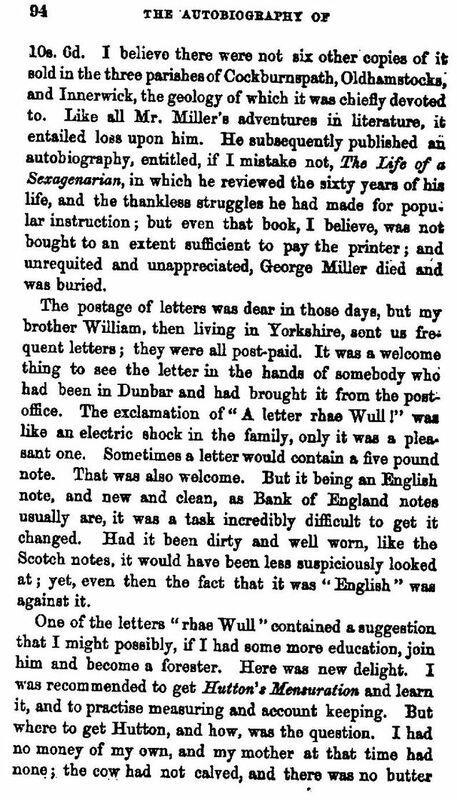 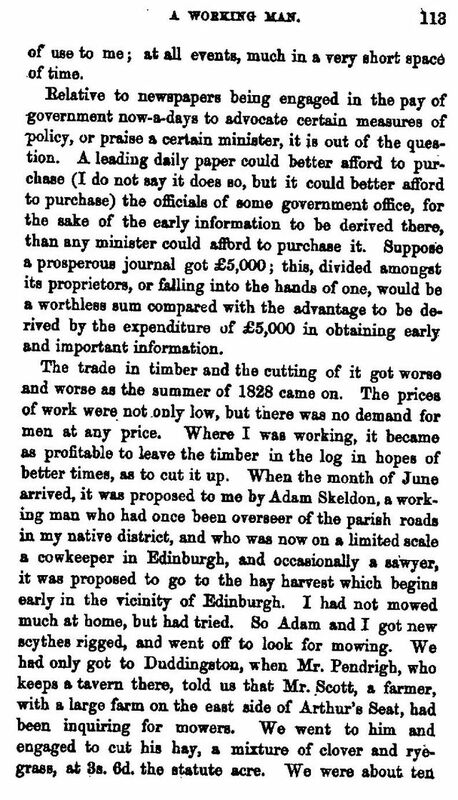 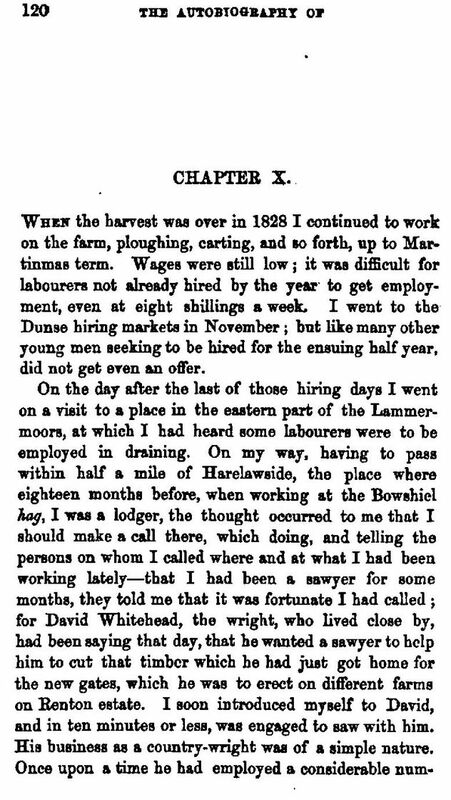 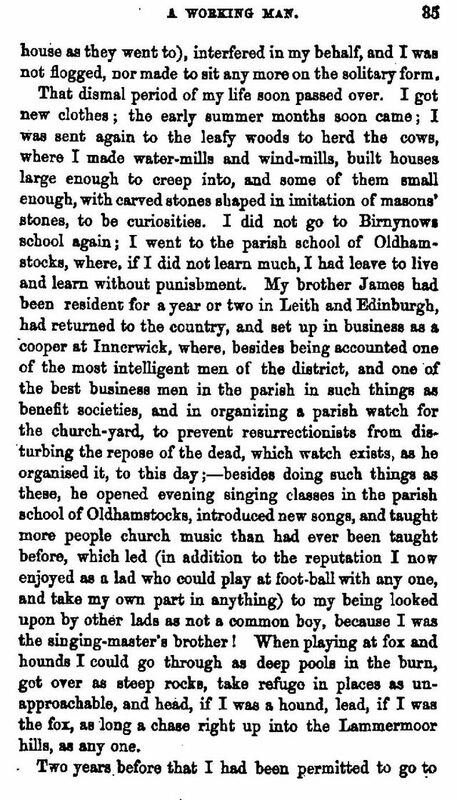 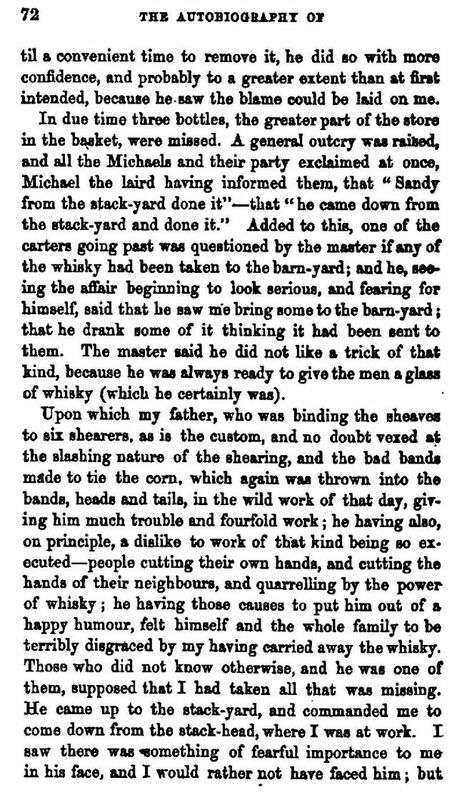 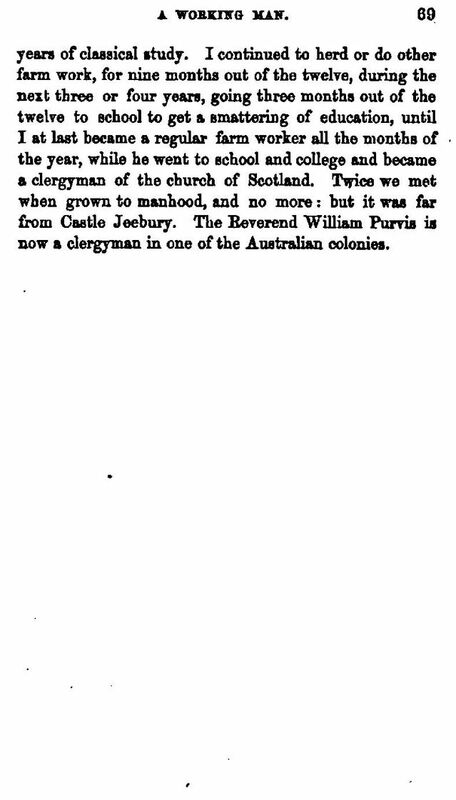 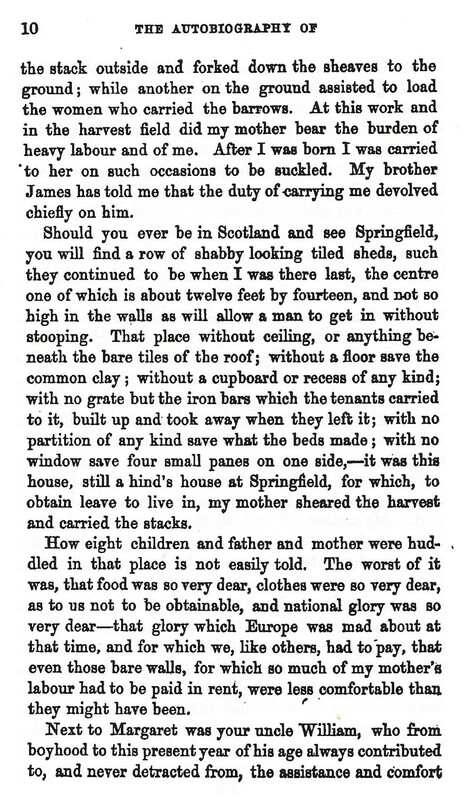 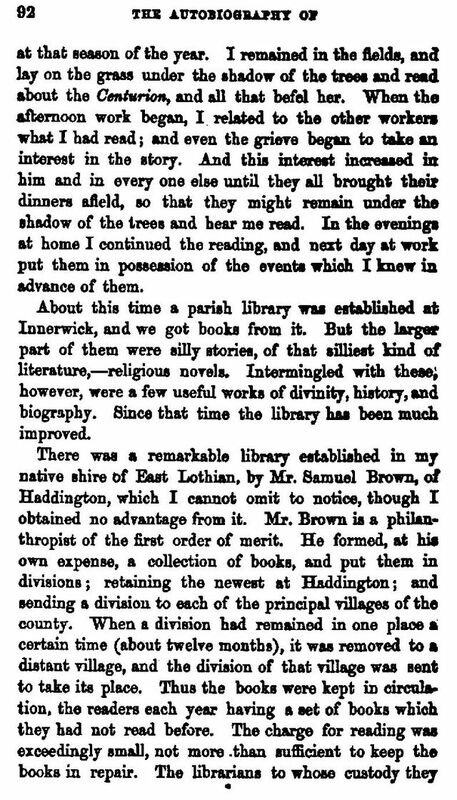 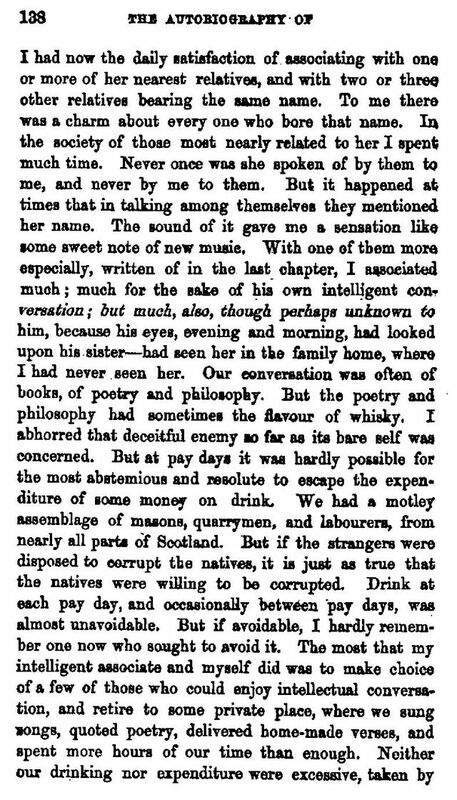 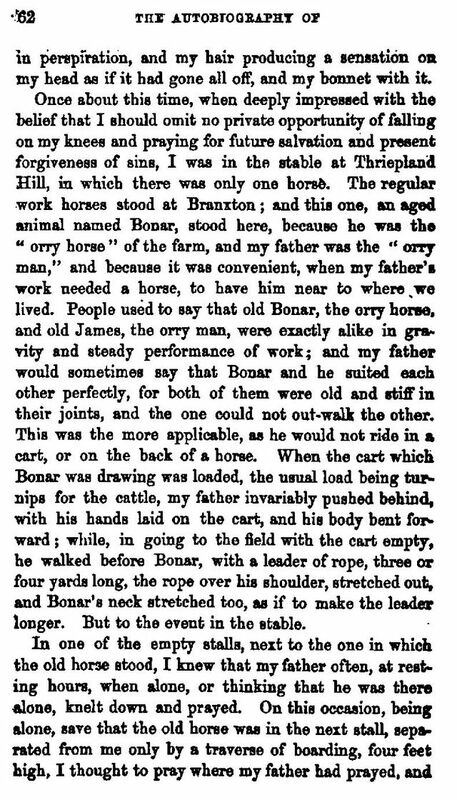 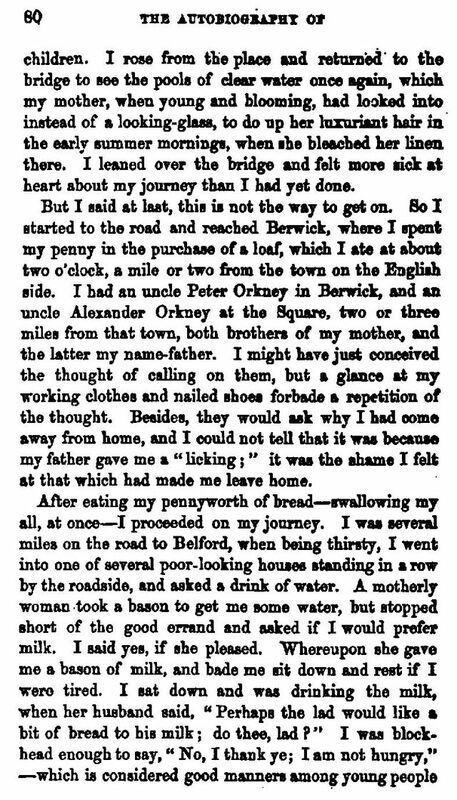 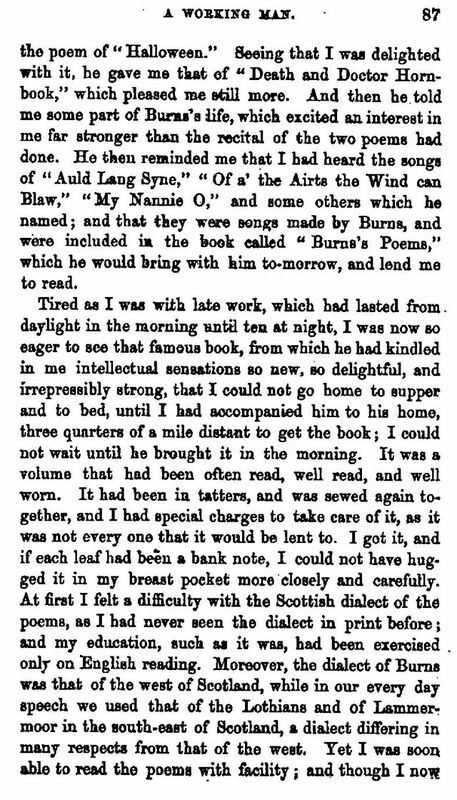 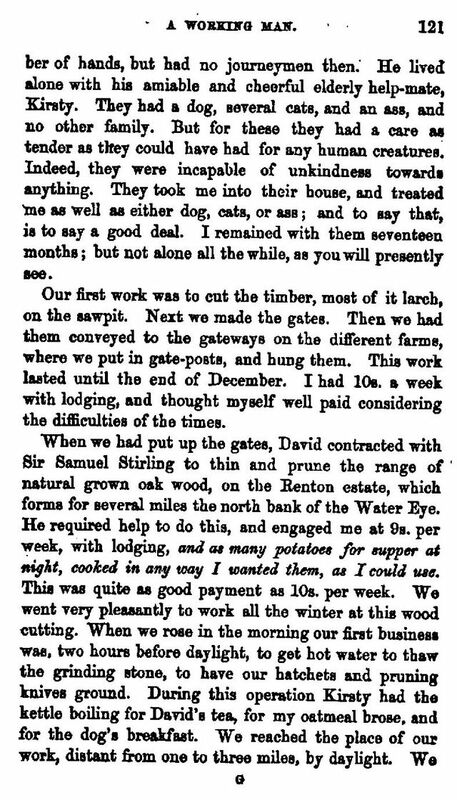 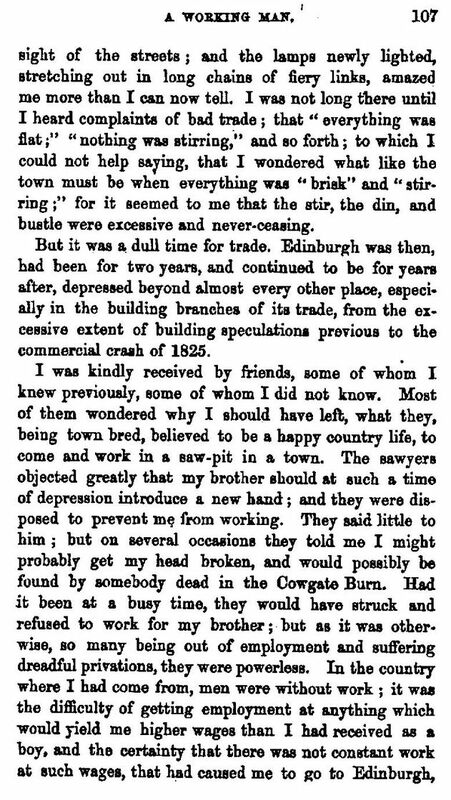 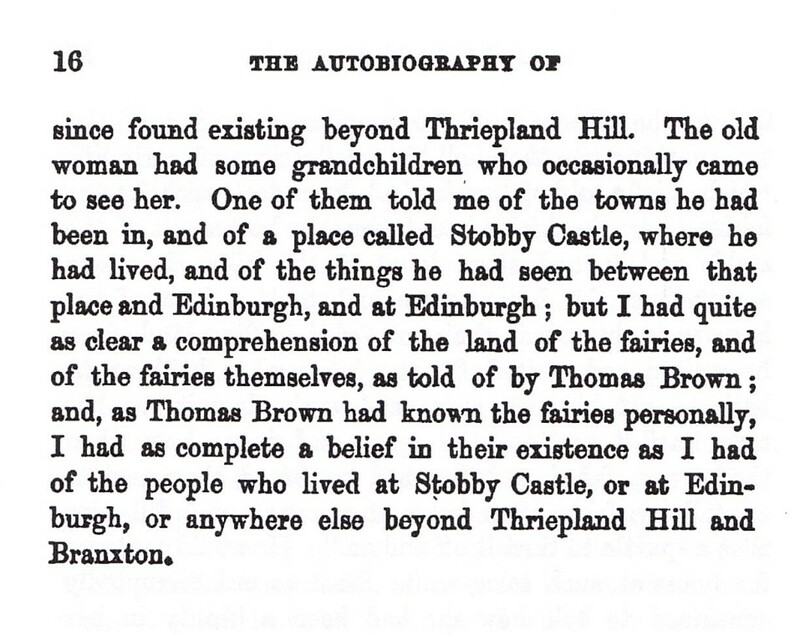 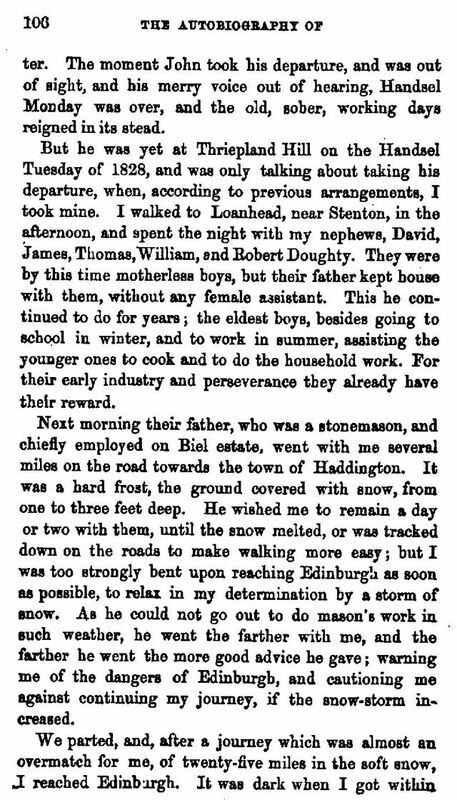 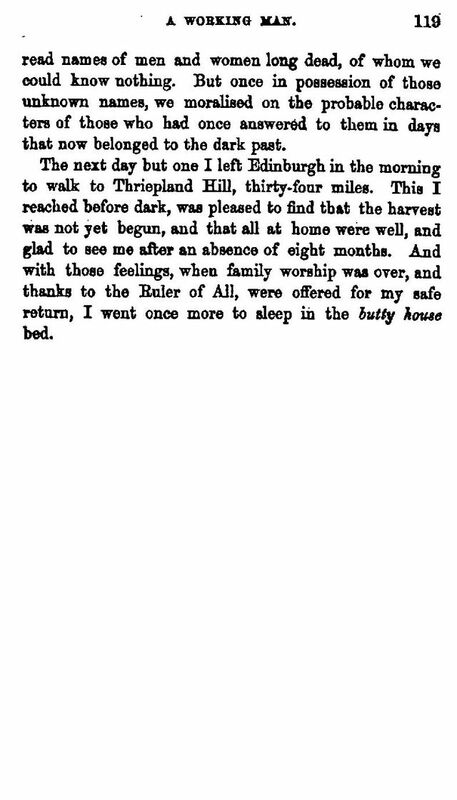 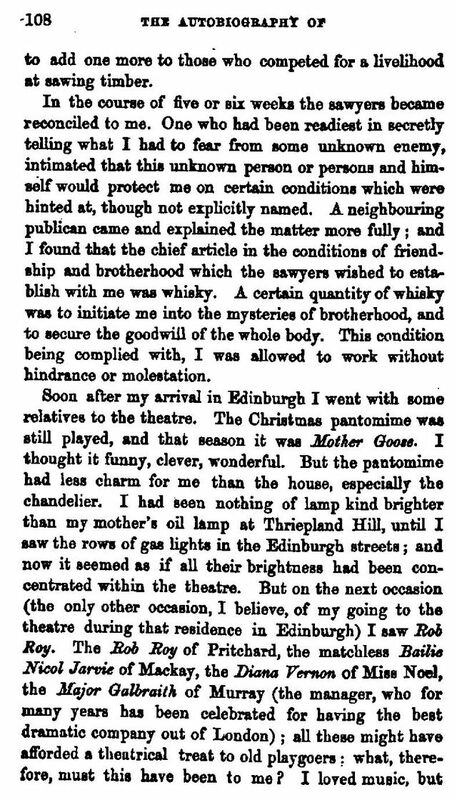 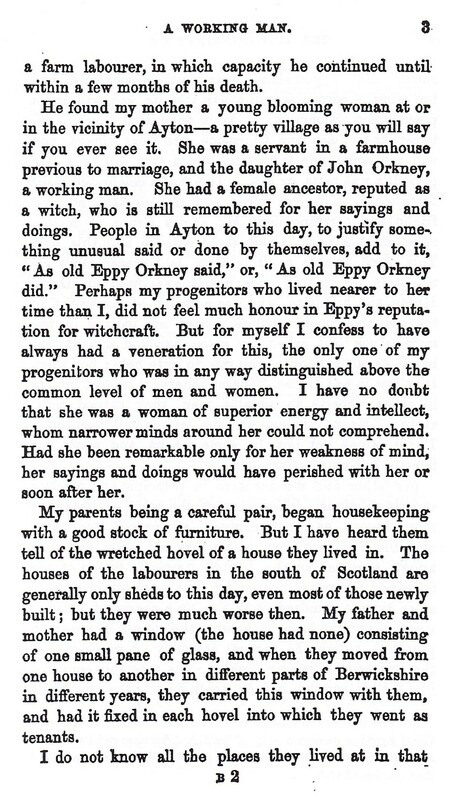 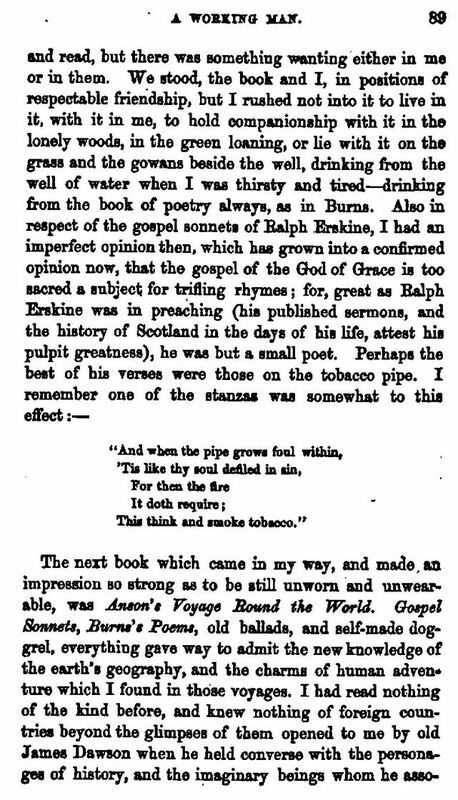 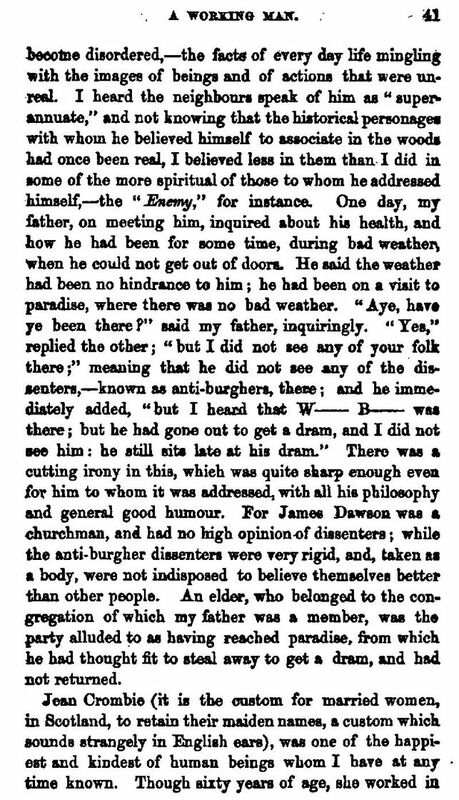 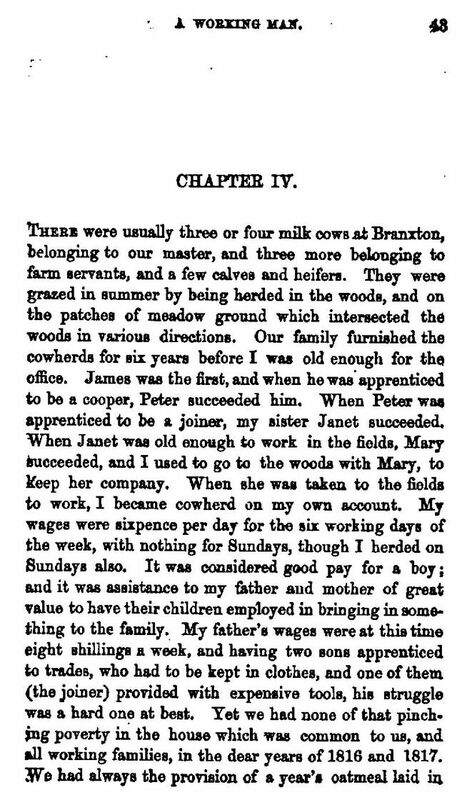 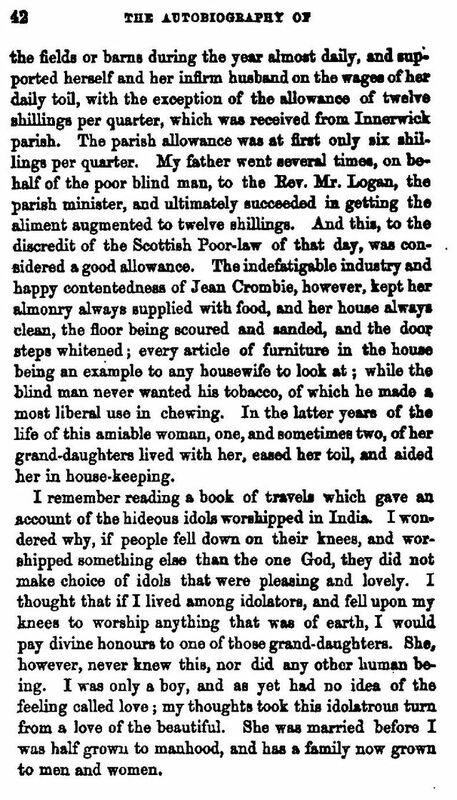 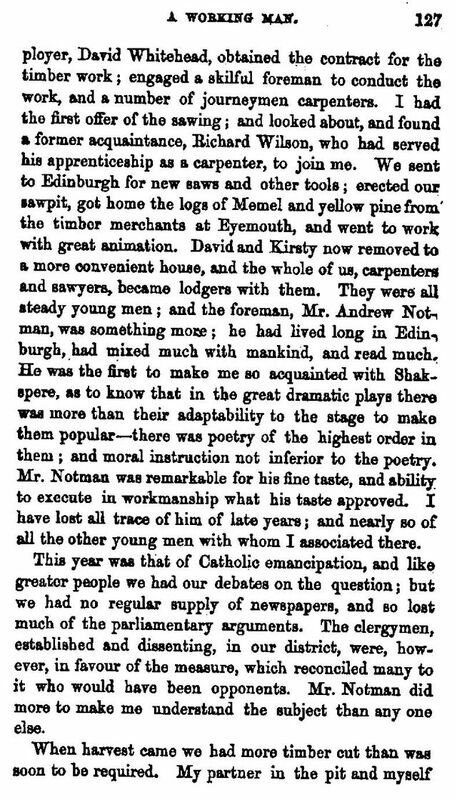 This short biography will be succeeded by a tranche of Alexander Somerville's own "Autobiography of a Working Man" or at covering his formative years in the Berwickshire and Dunbar areas. 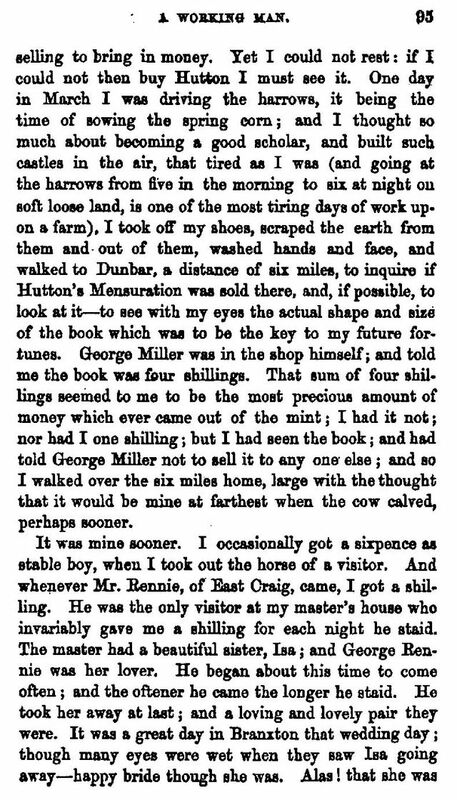 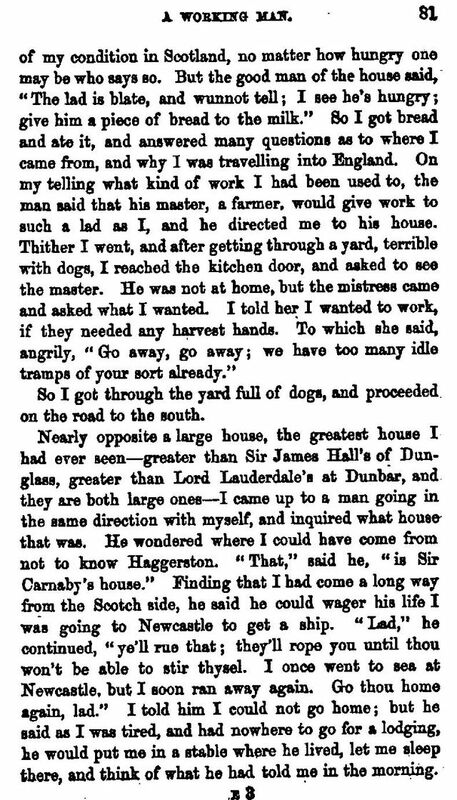 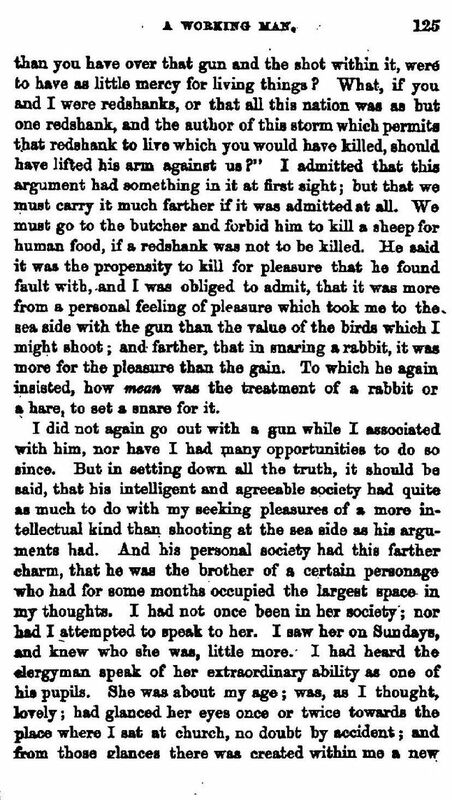 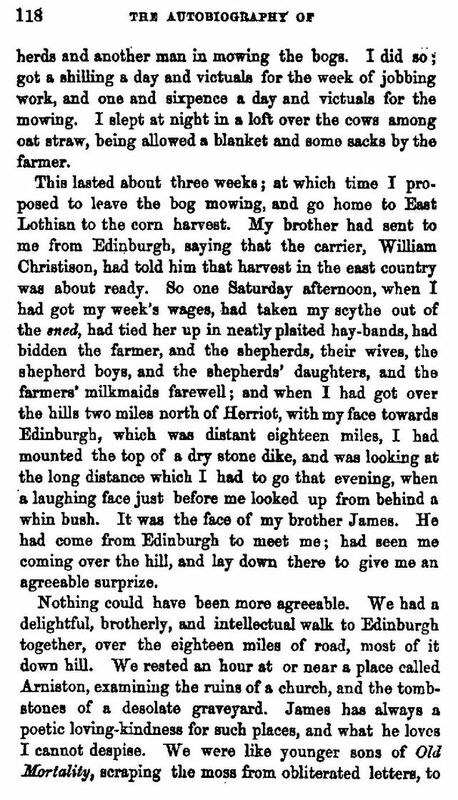 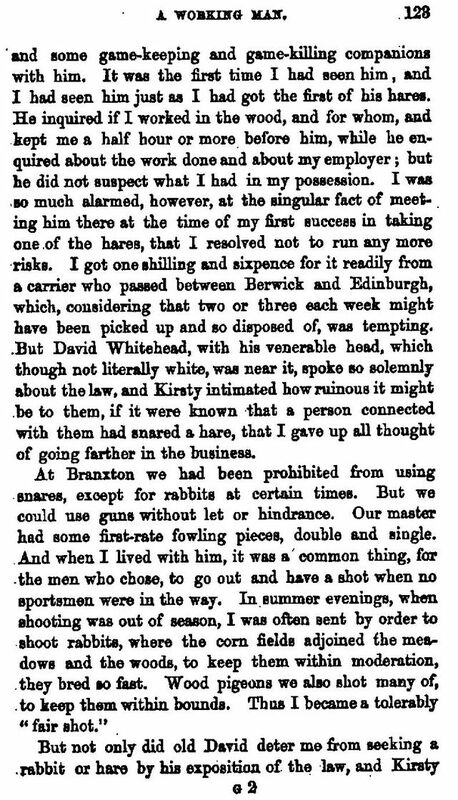 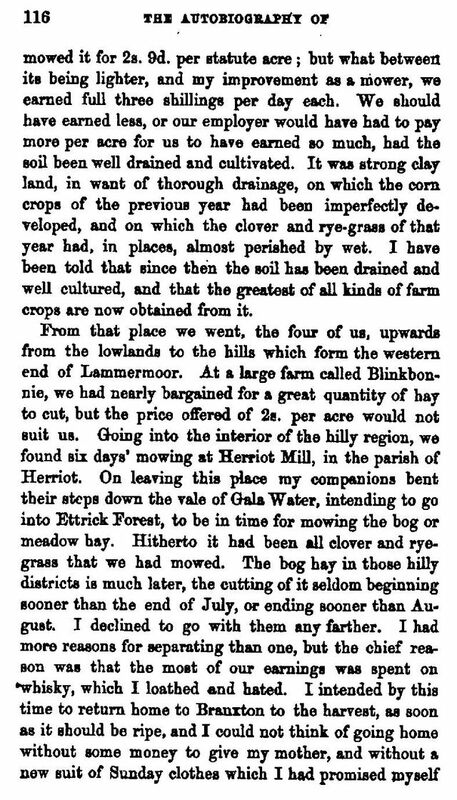 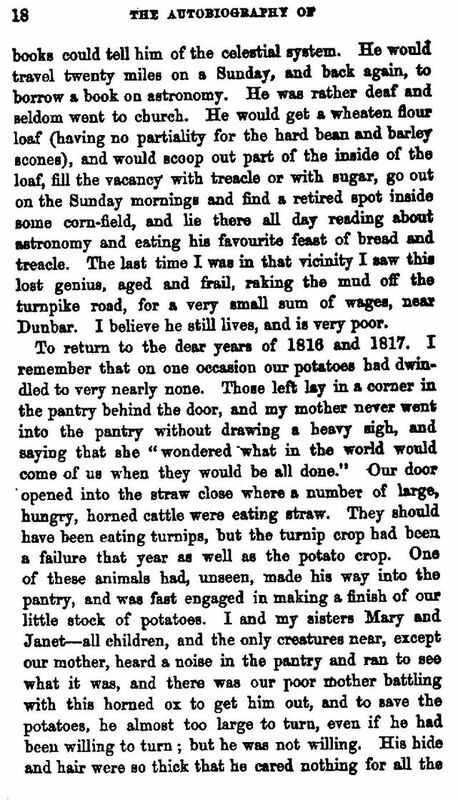 Alexander Somerville's account of farm life in the vicinity of Dunbar in the first half of the nineteenth century is a 'must read' for those interested in agriculture and local history. 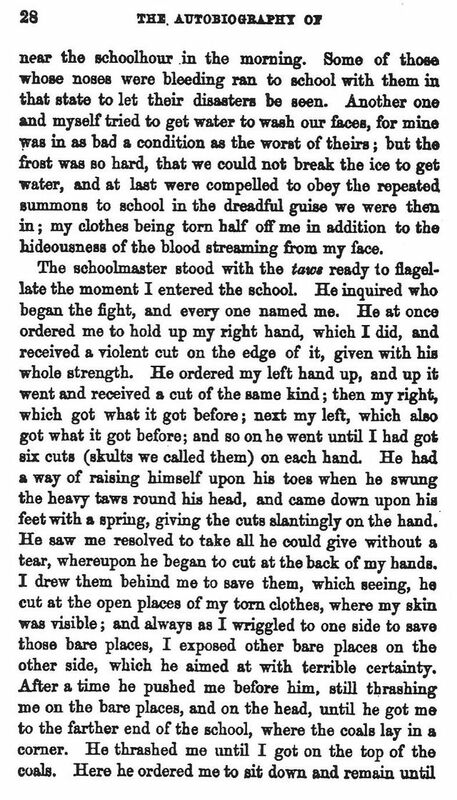 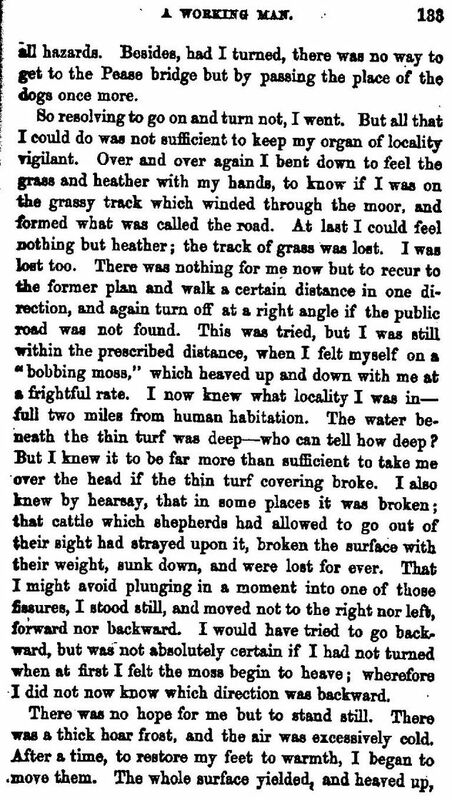 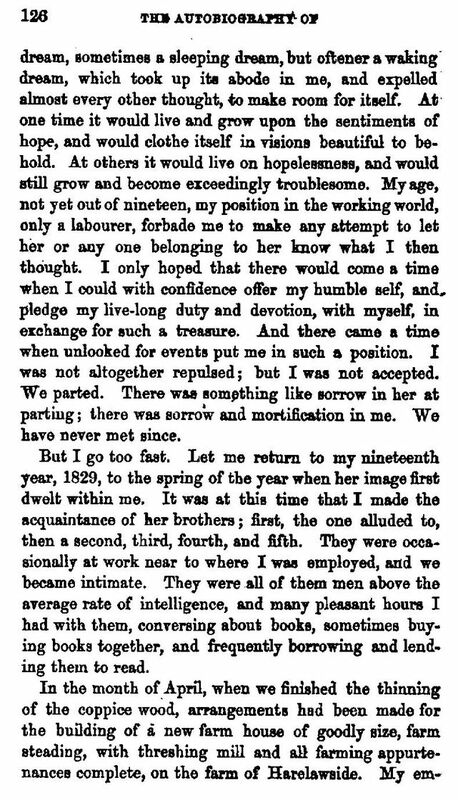 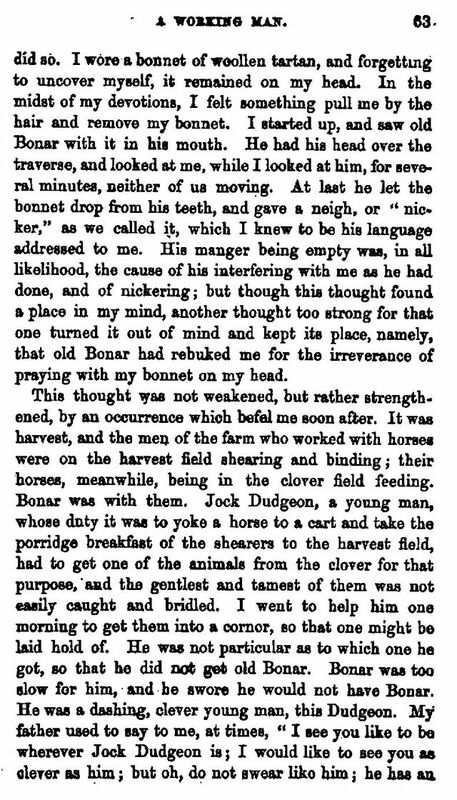 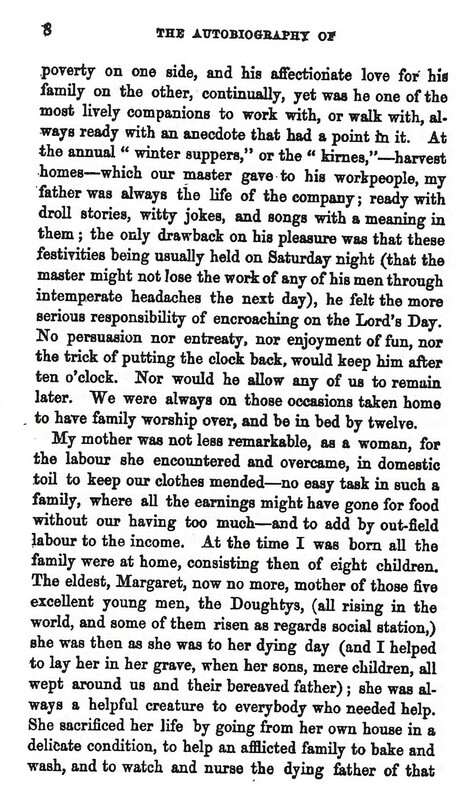 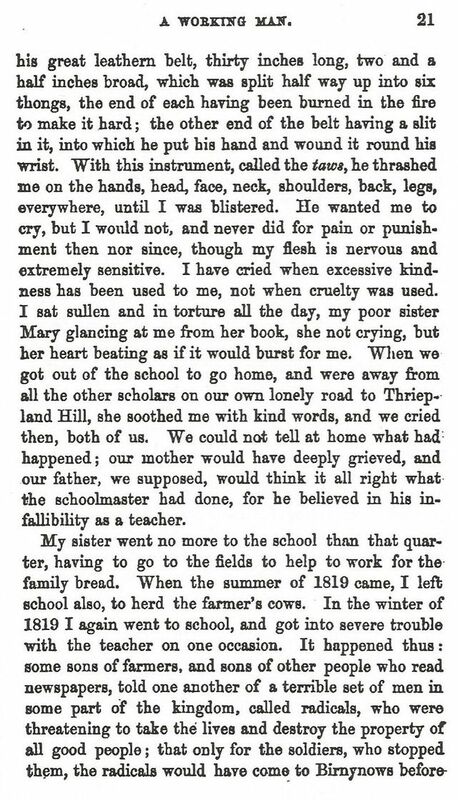 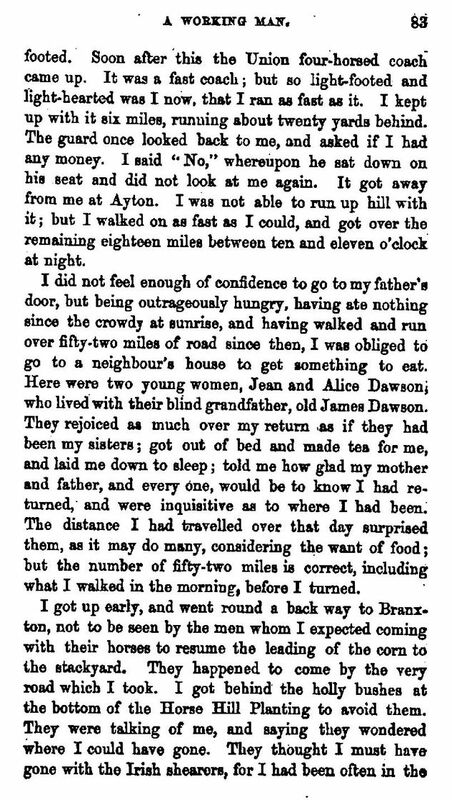 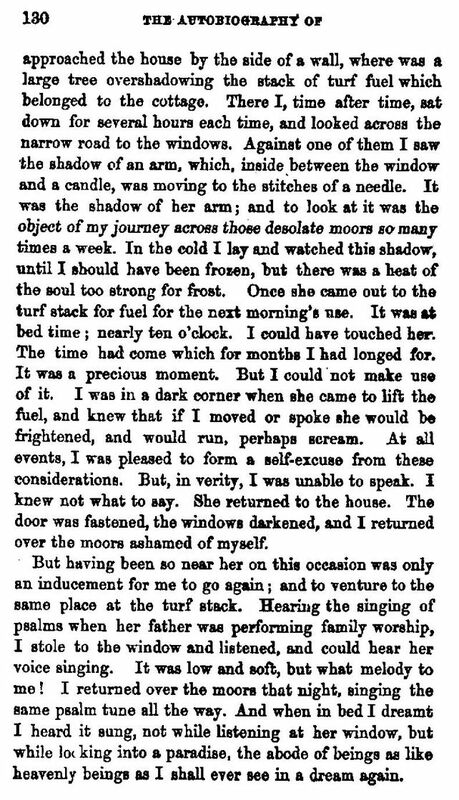 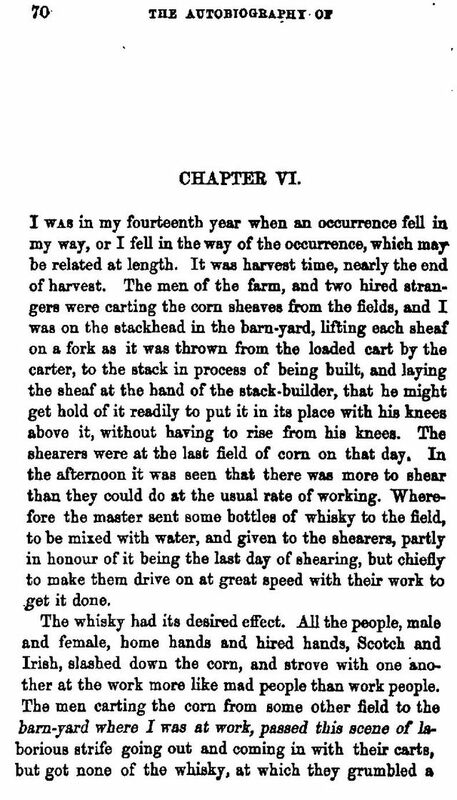 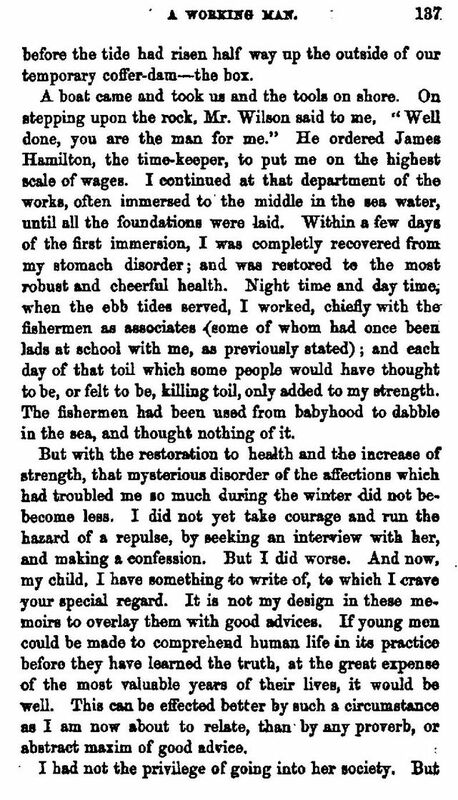 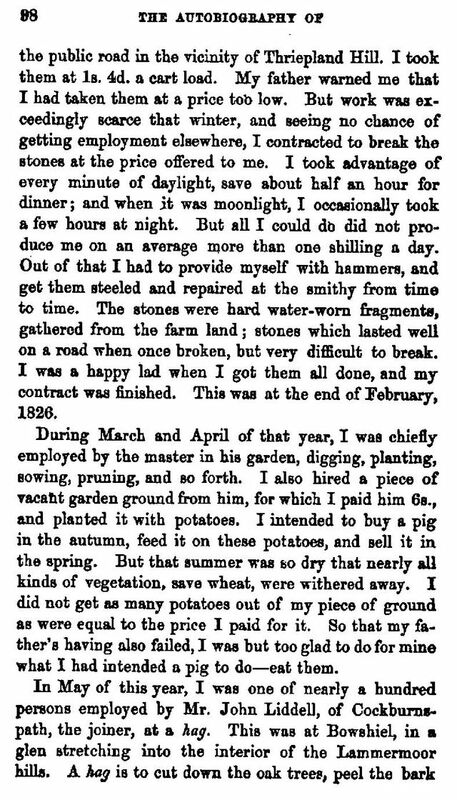 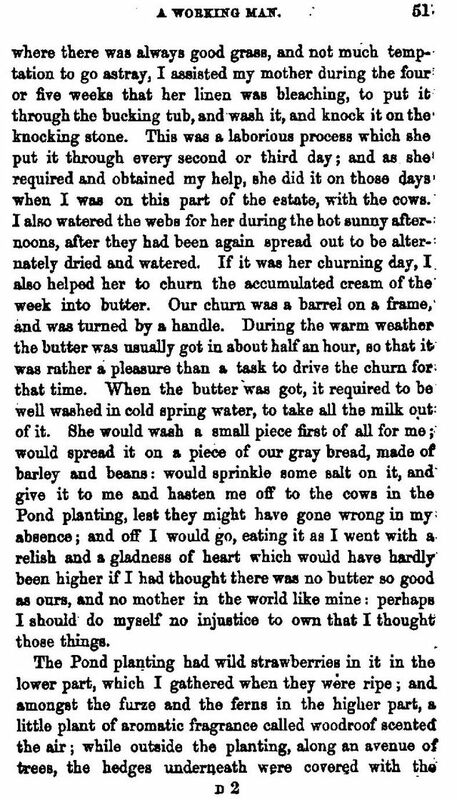 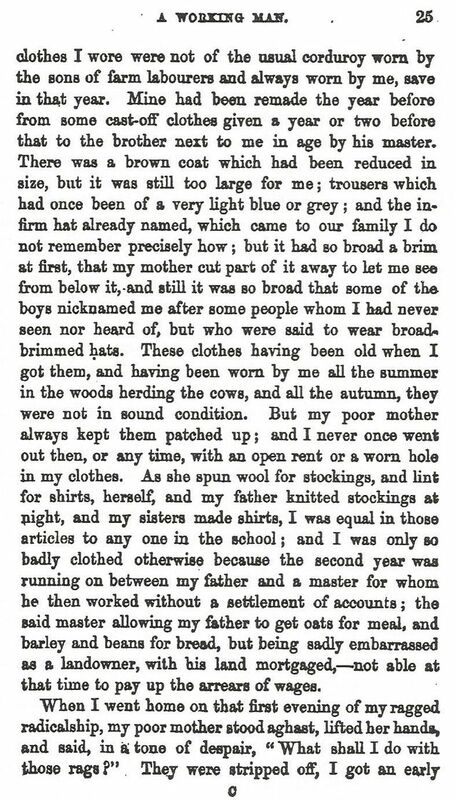 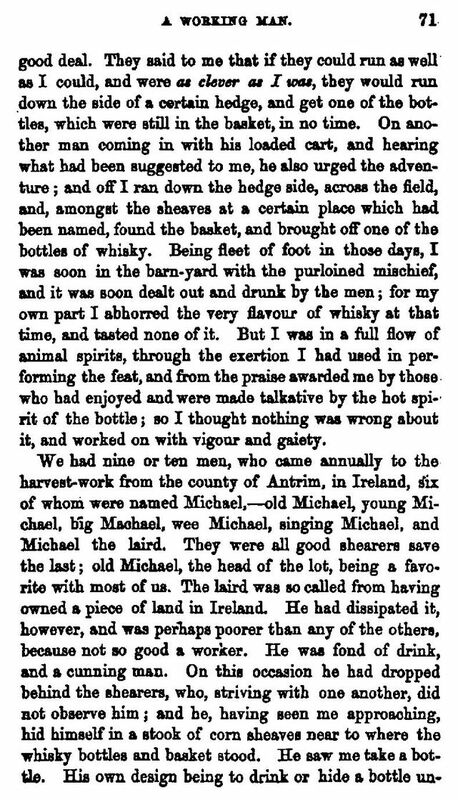 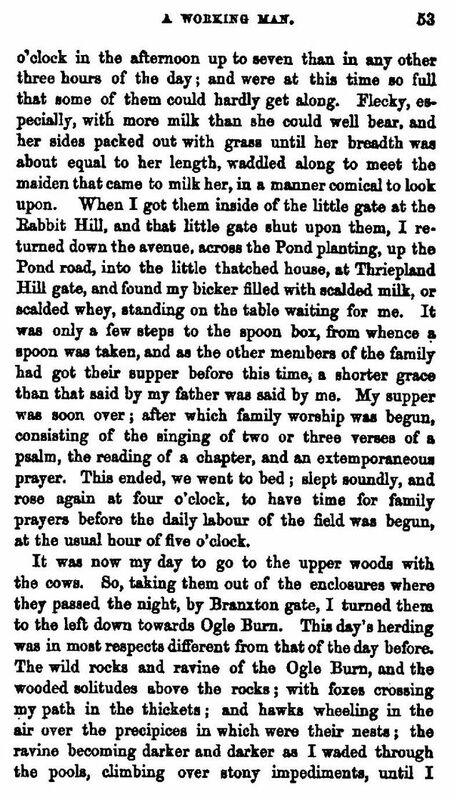 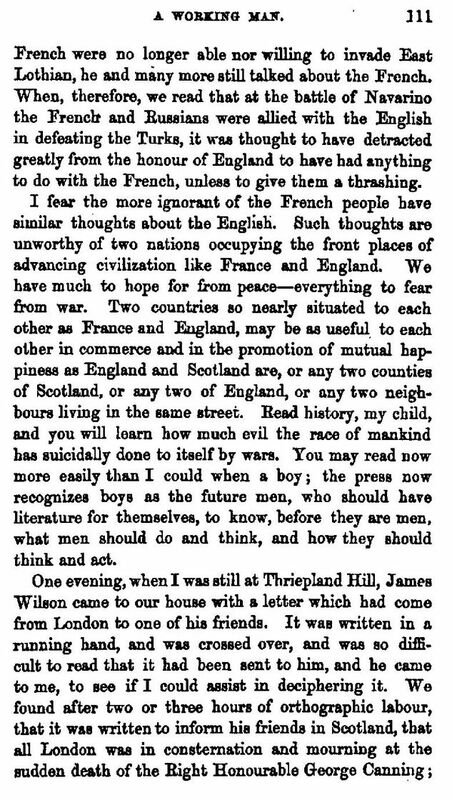 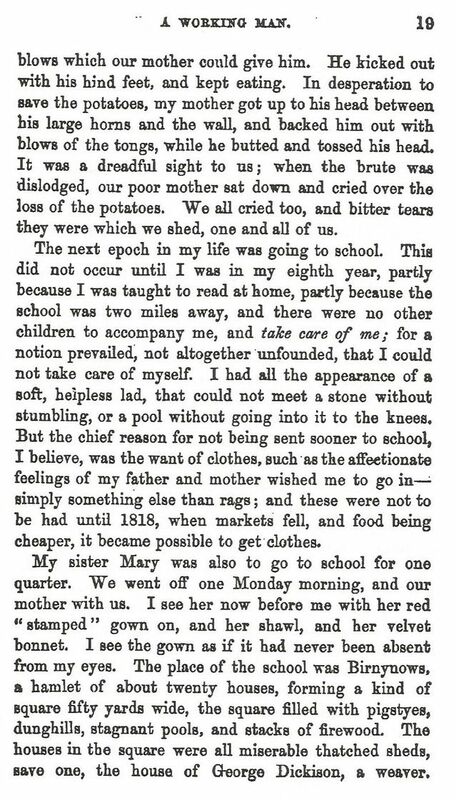 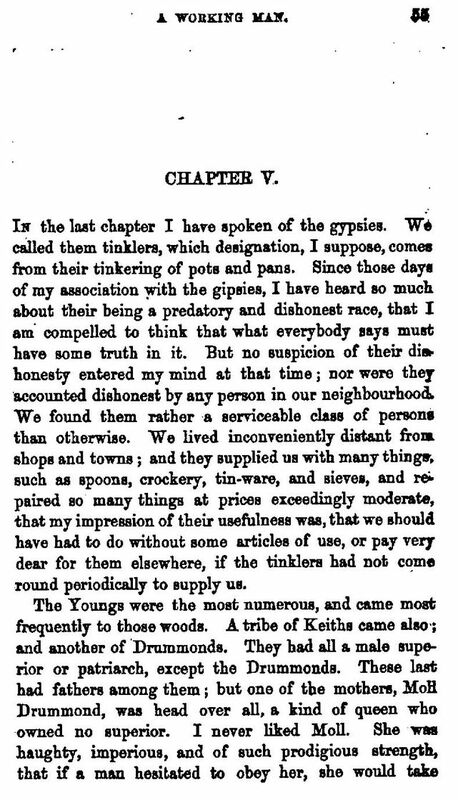 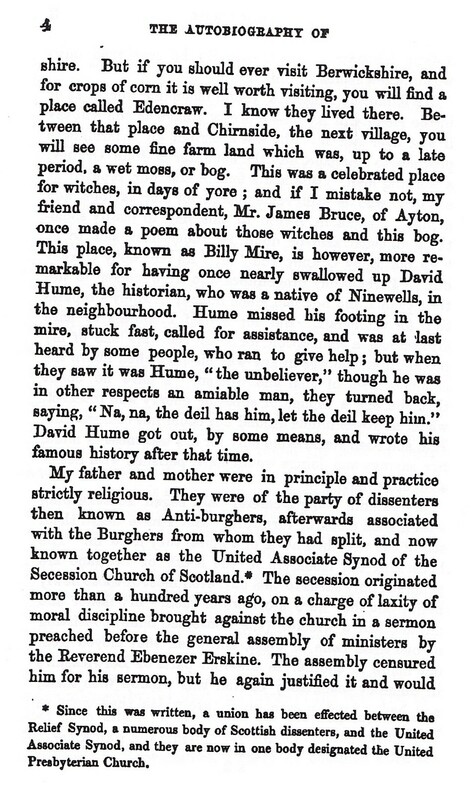 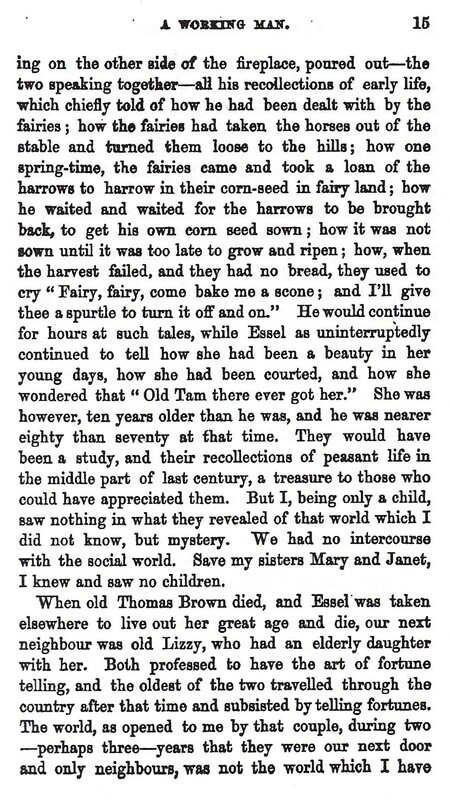 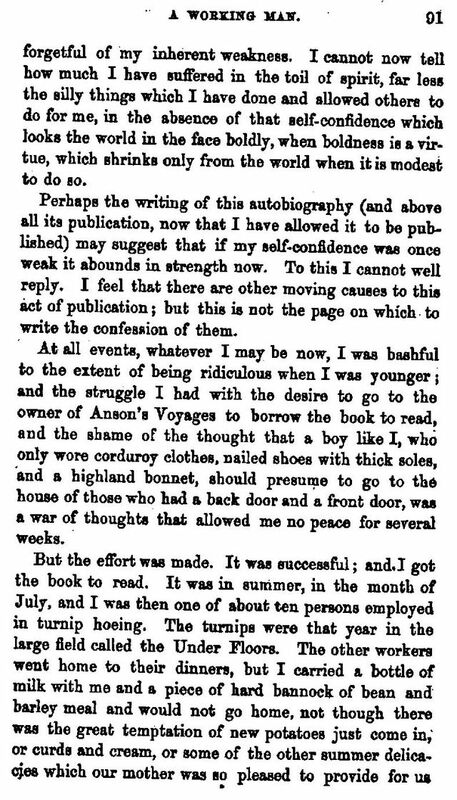 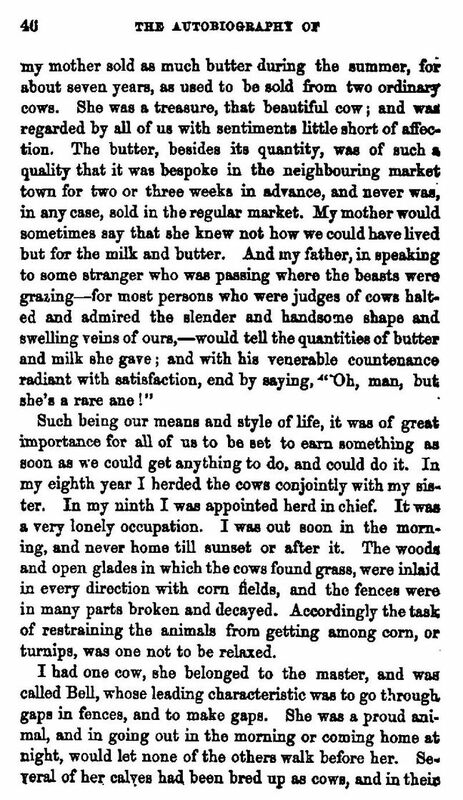 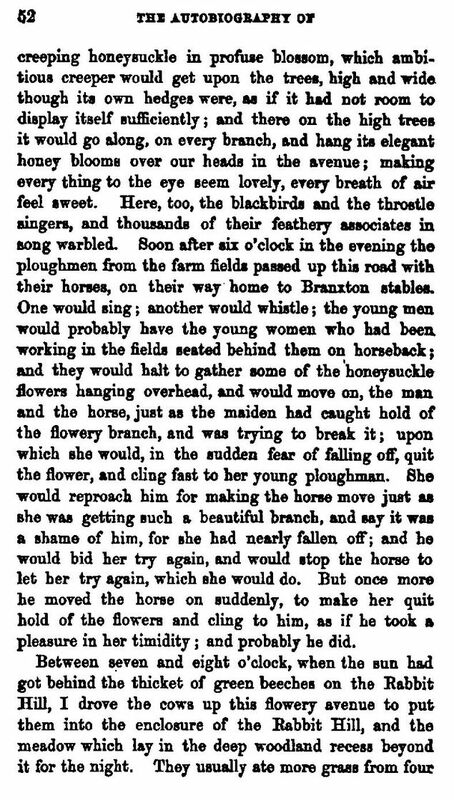 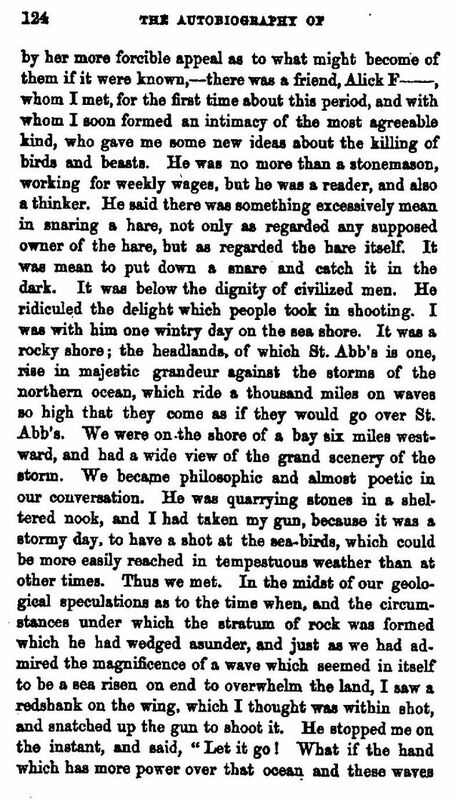 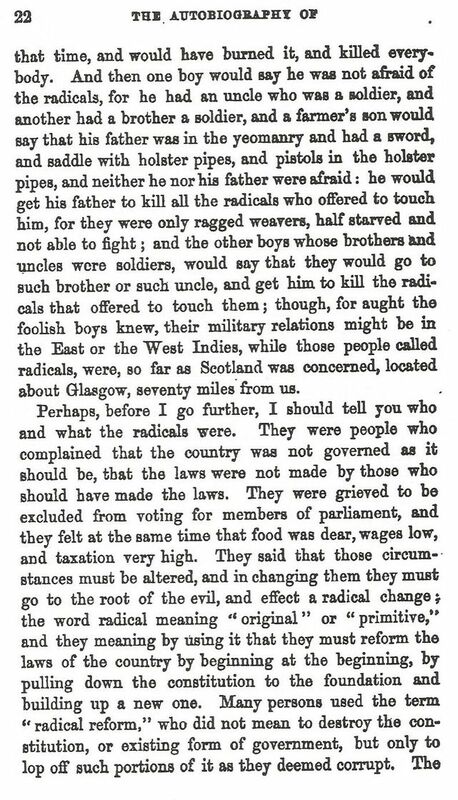 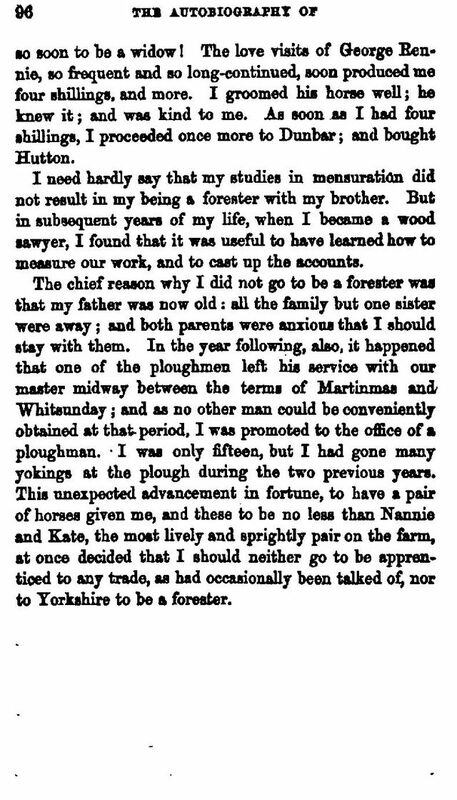 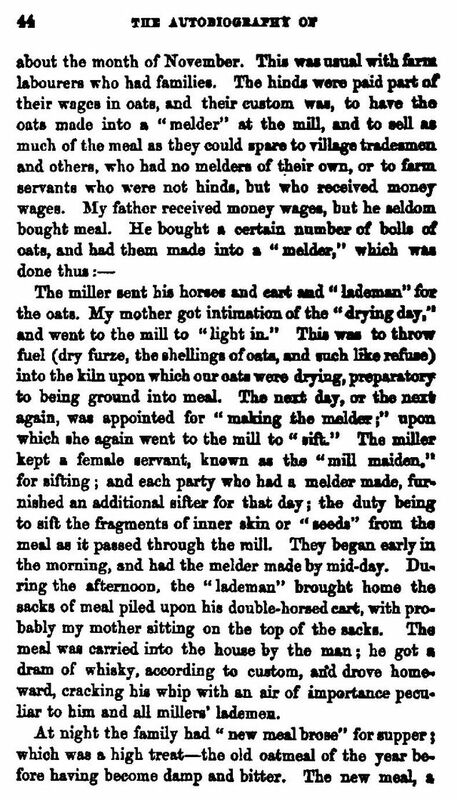 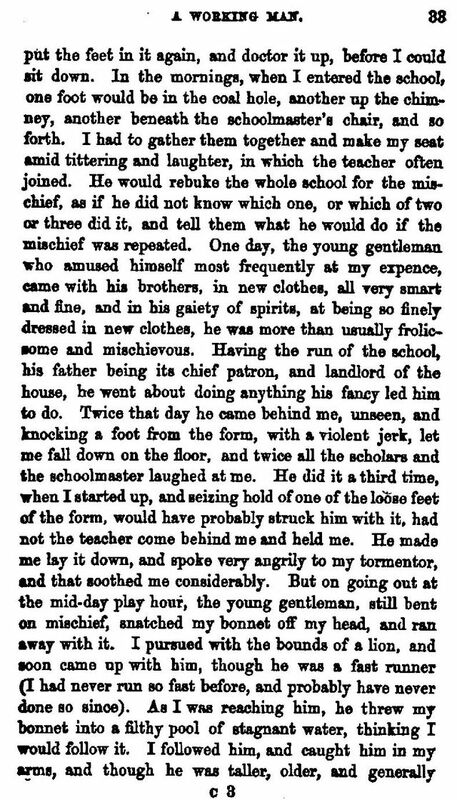 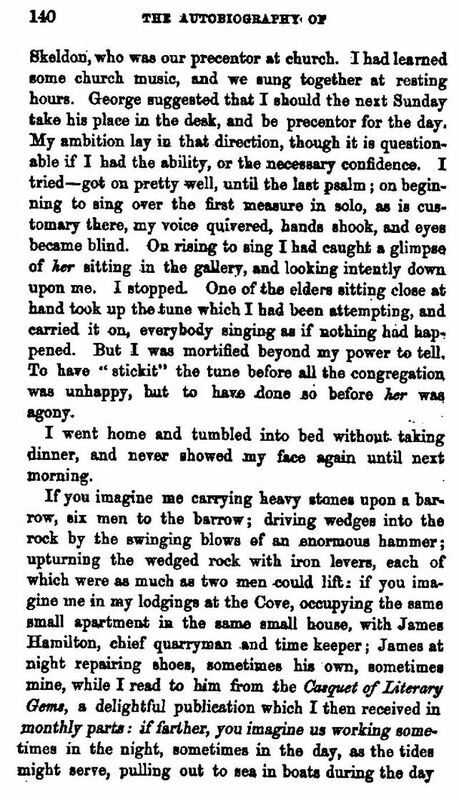 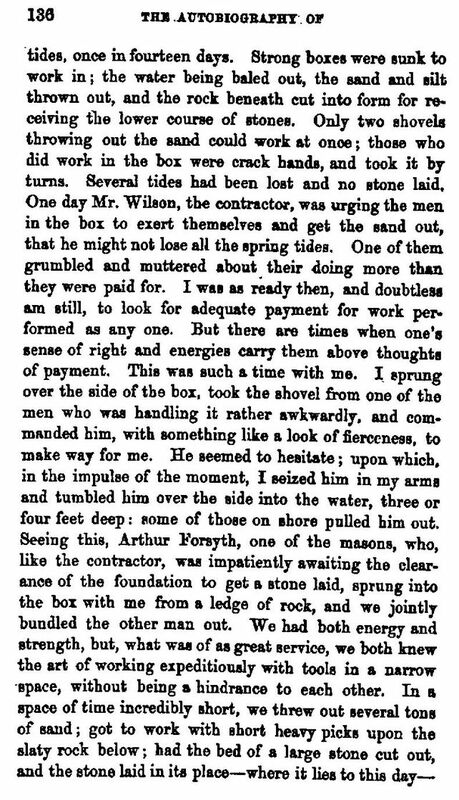 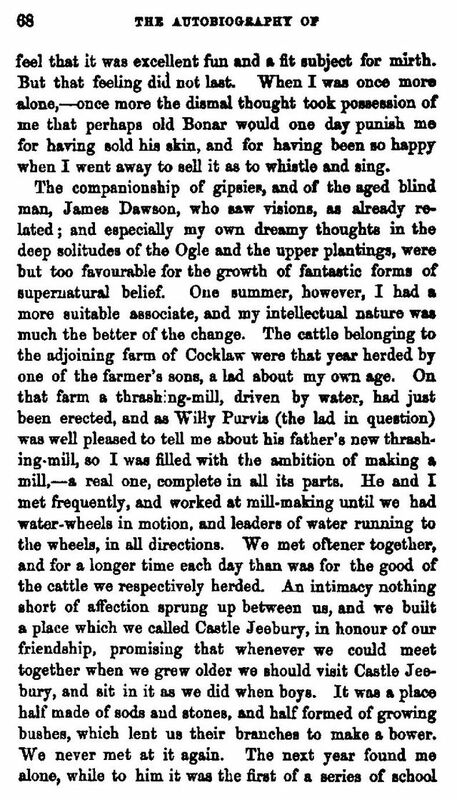 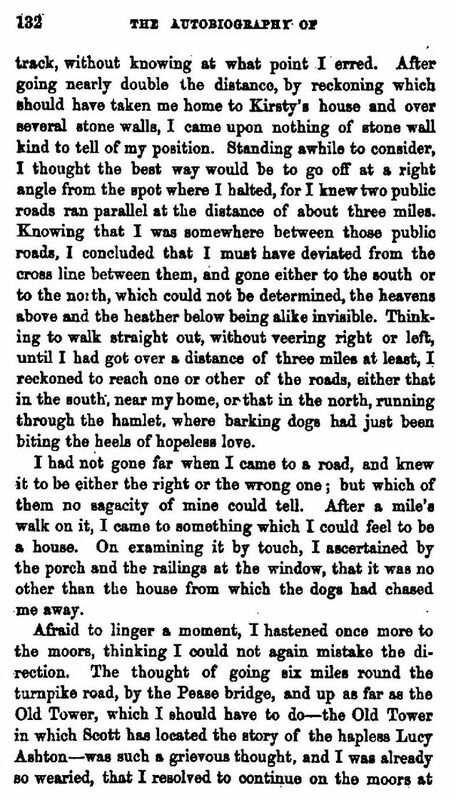 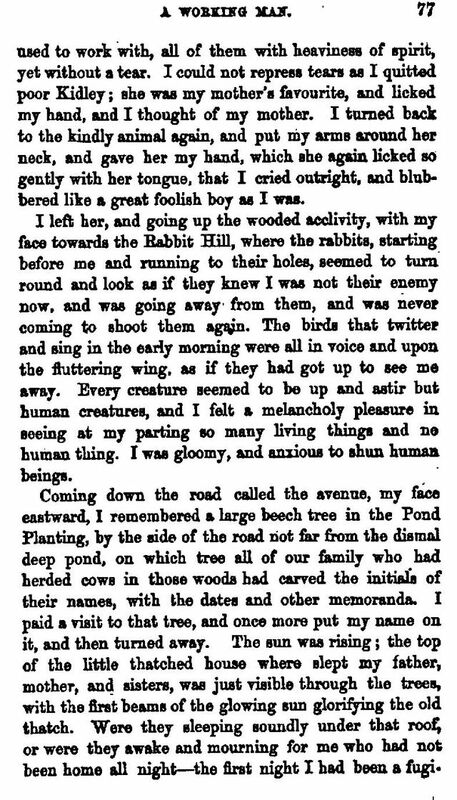 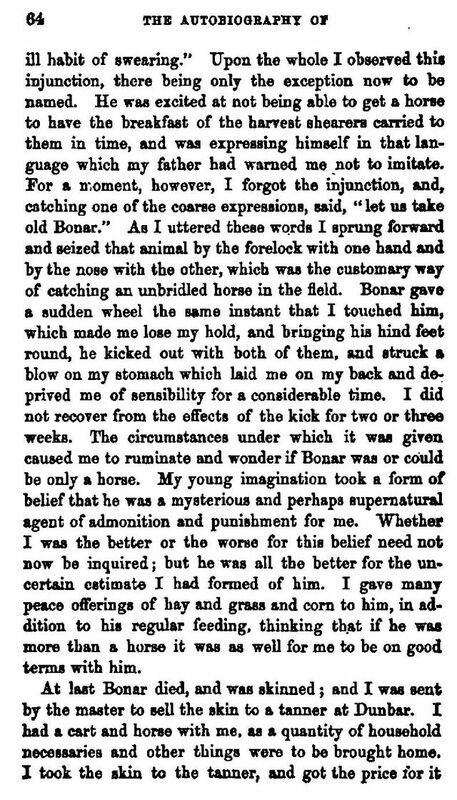 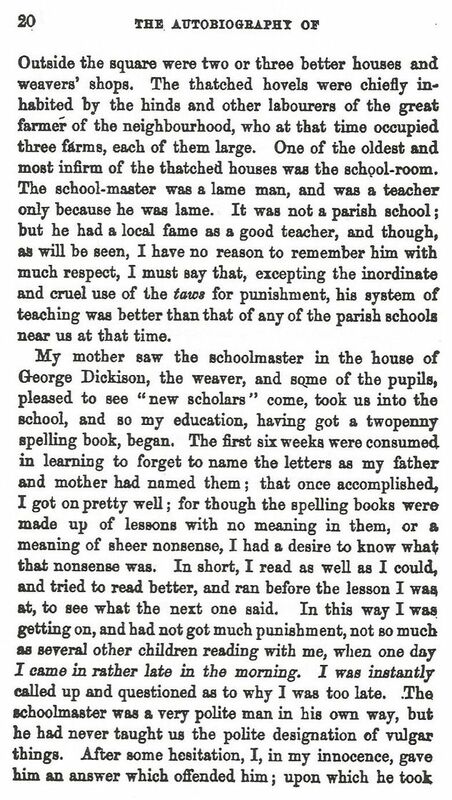 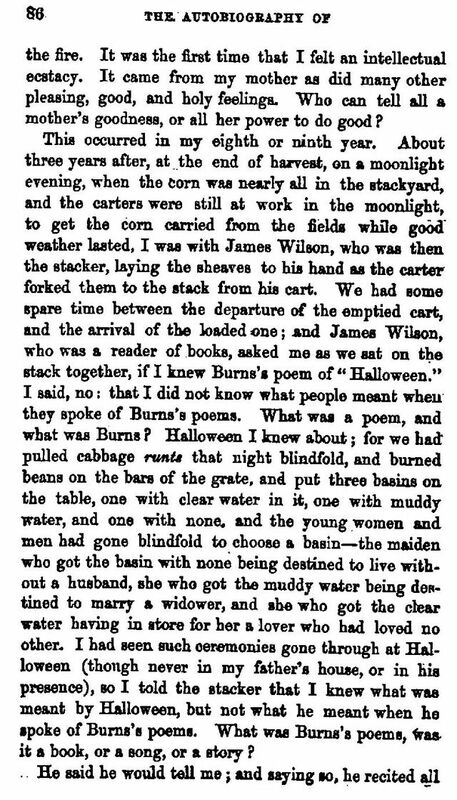 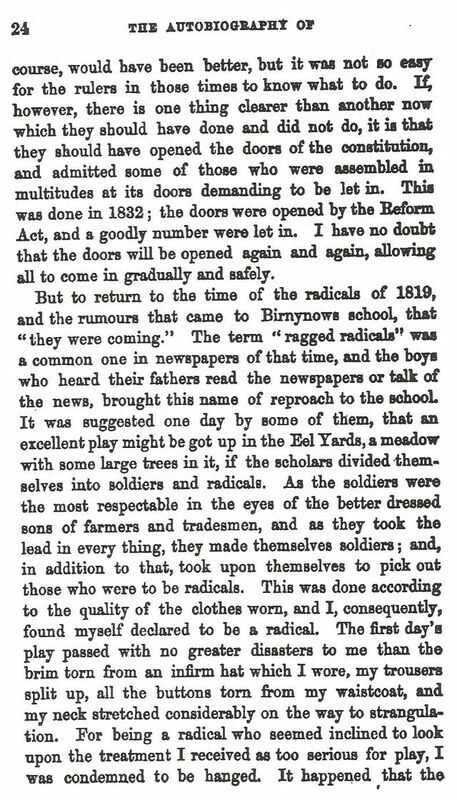 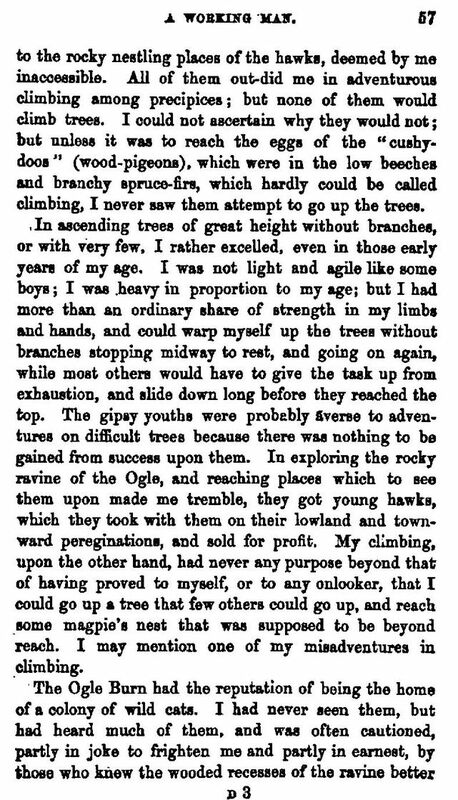 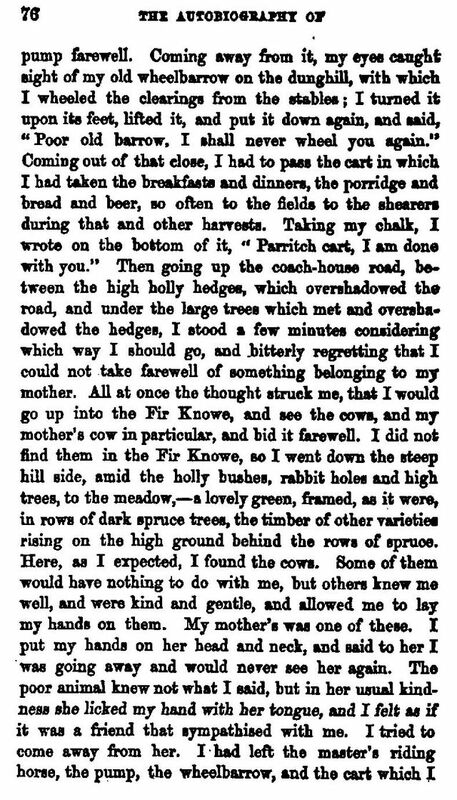 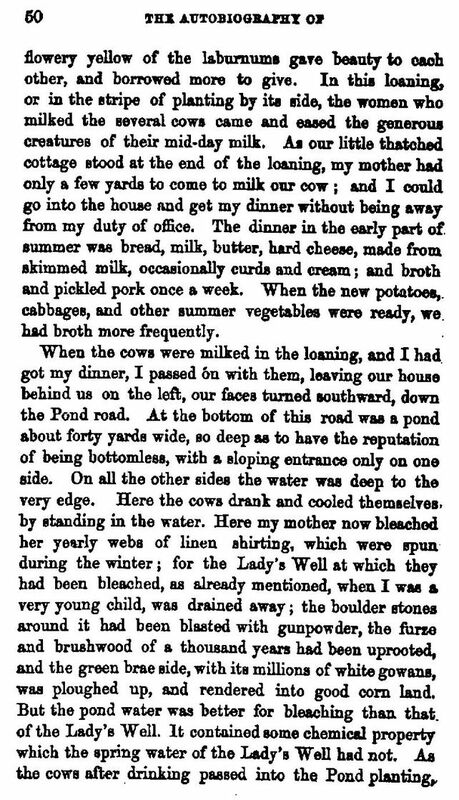 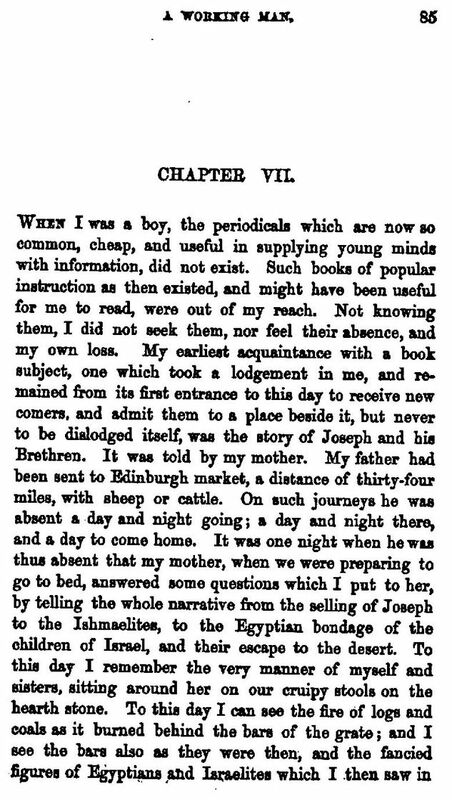 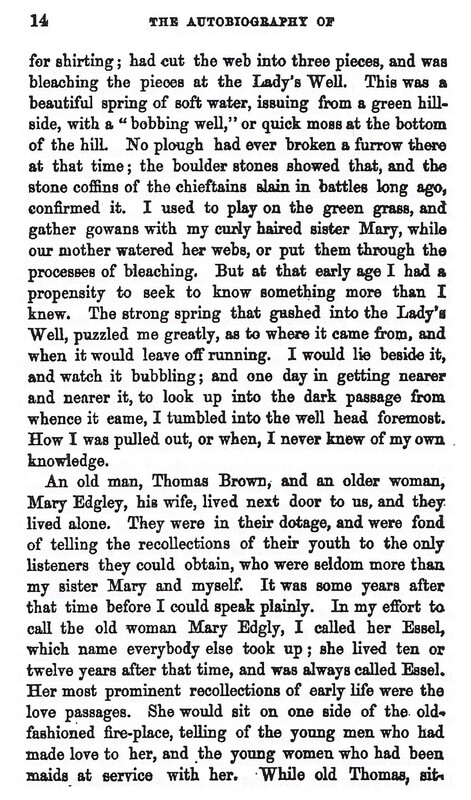 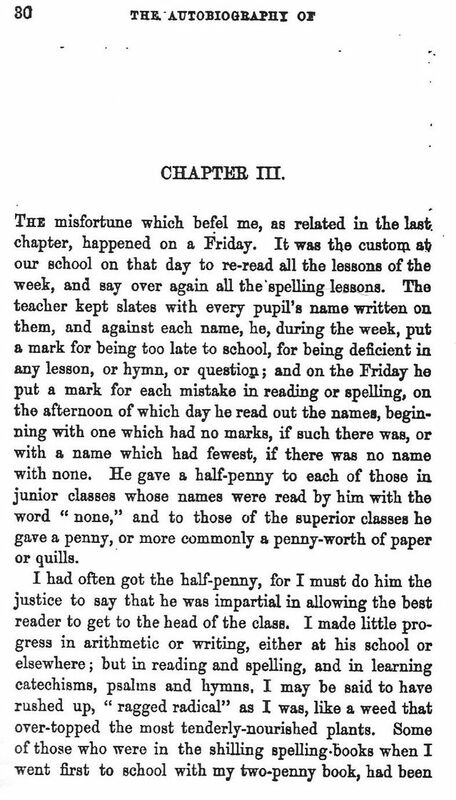 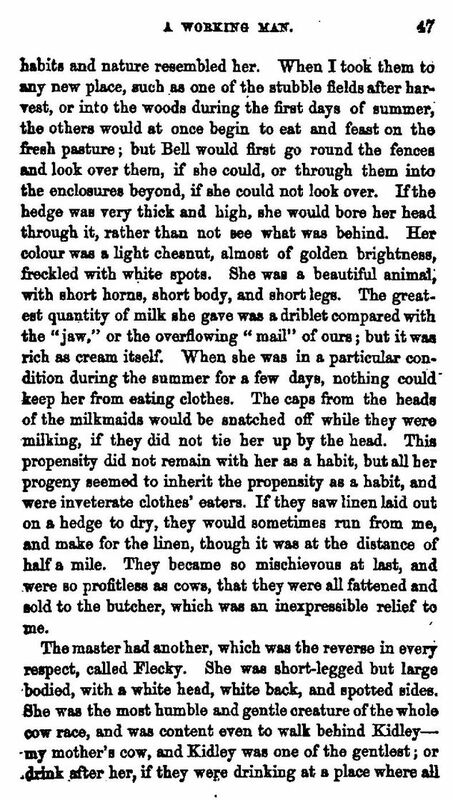 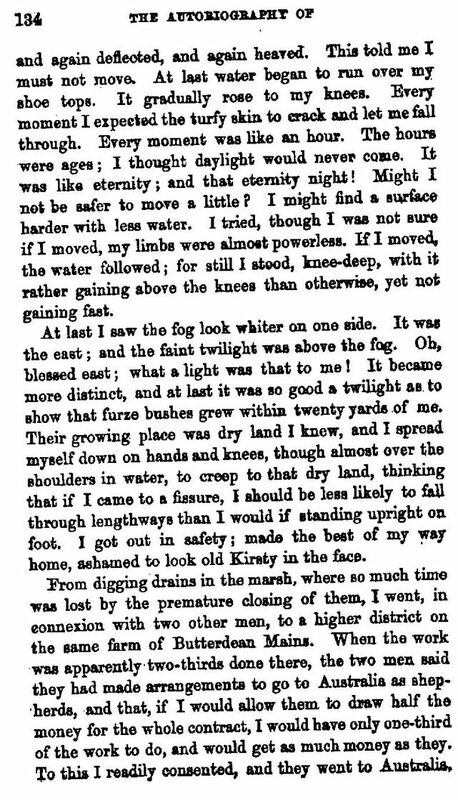 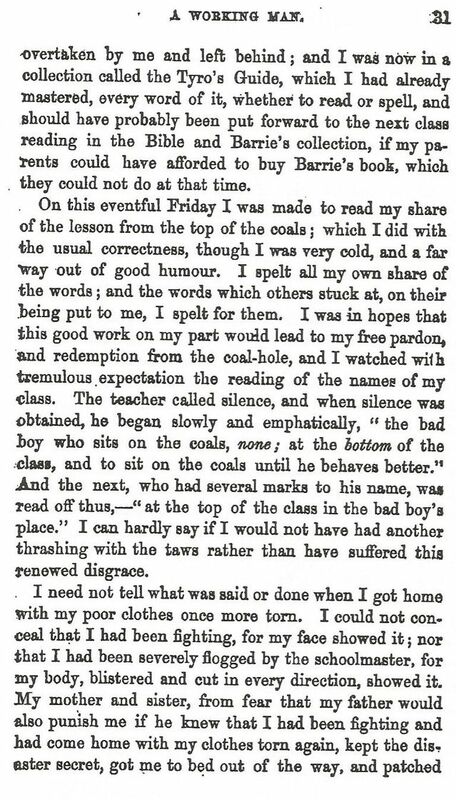 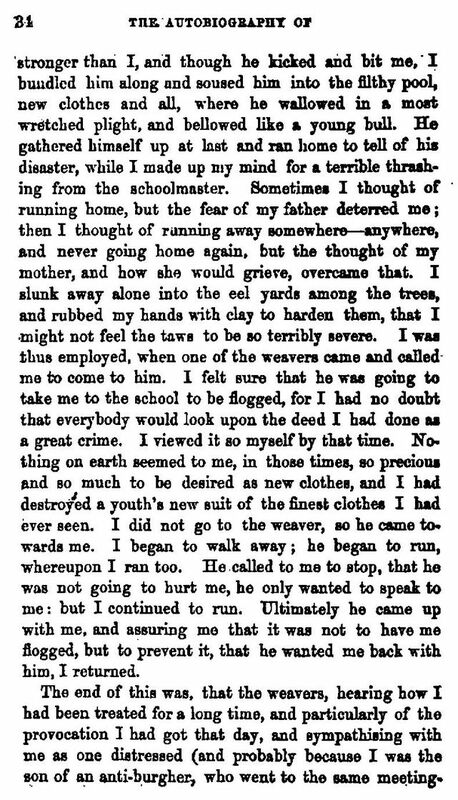 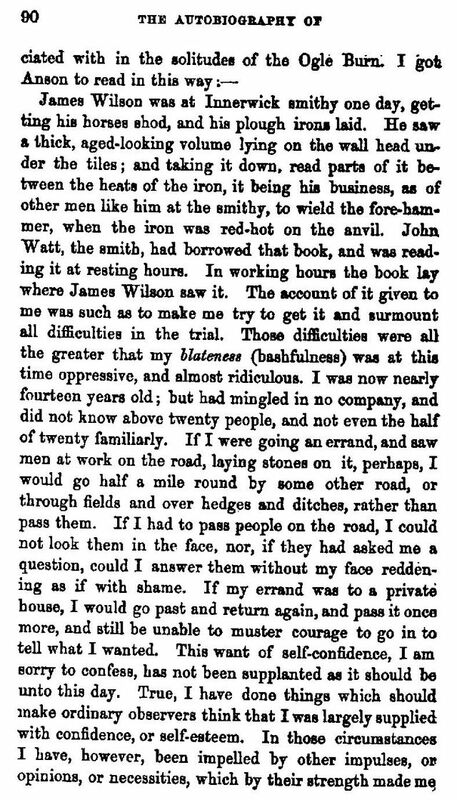 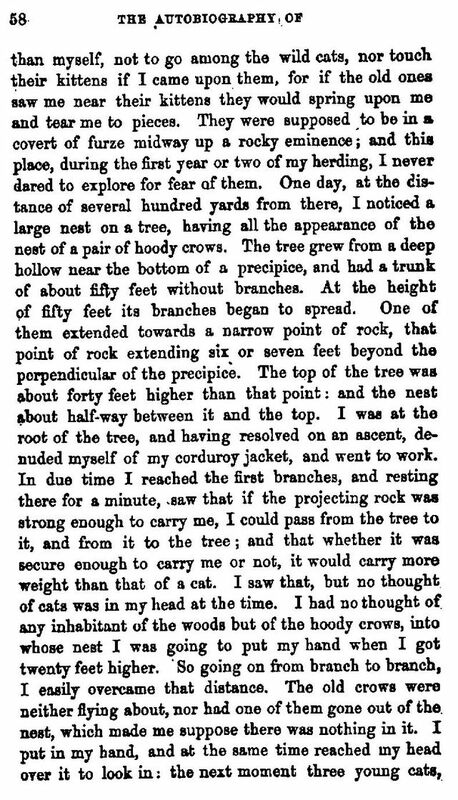 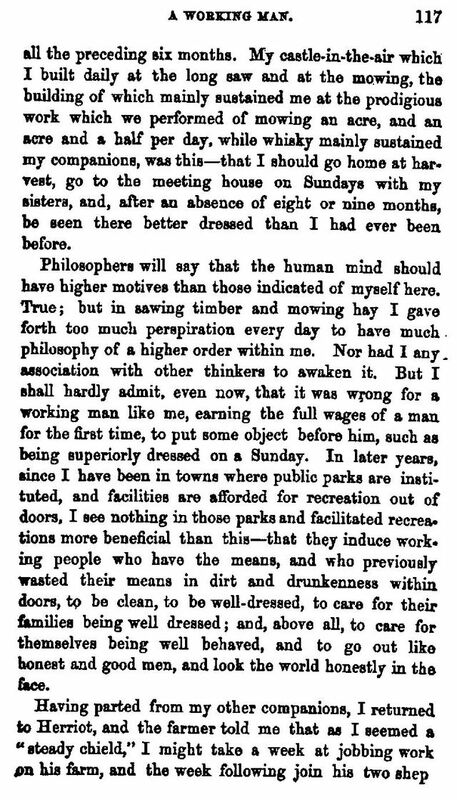 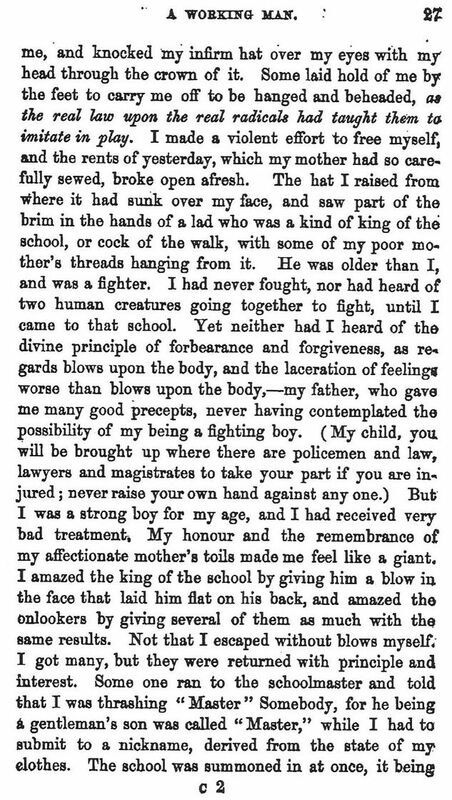 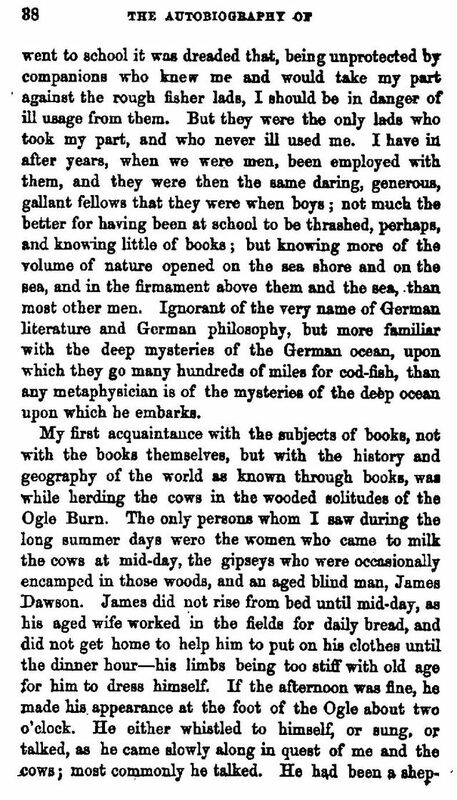 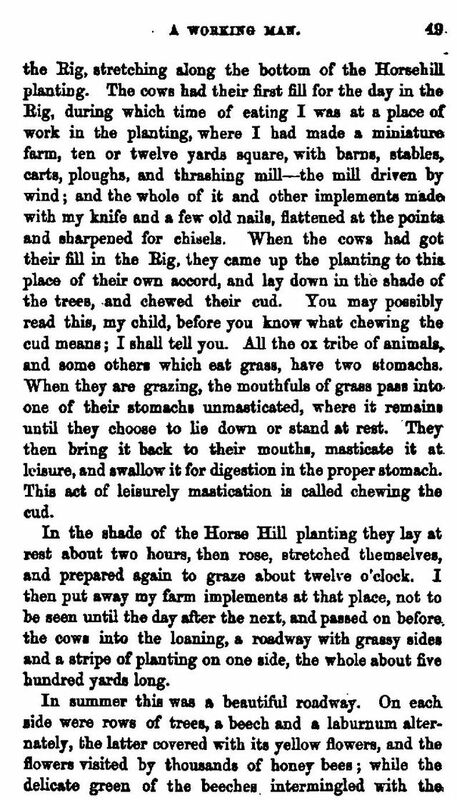 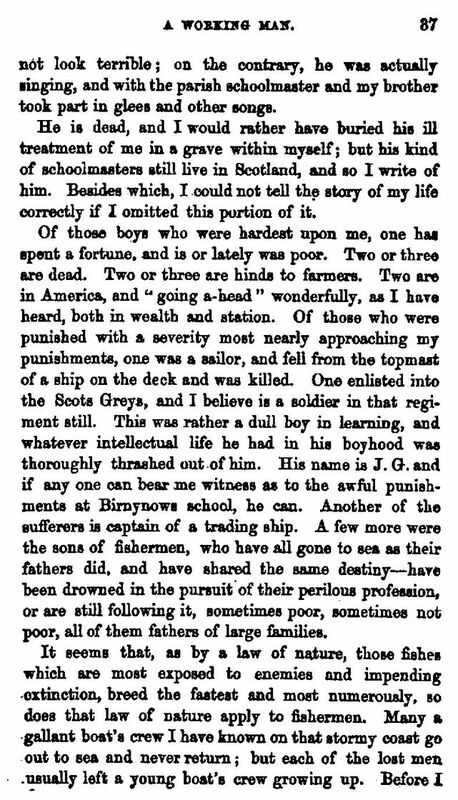 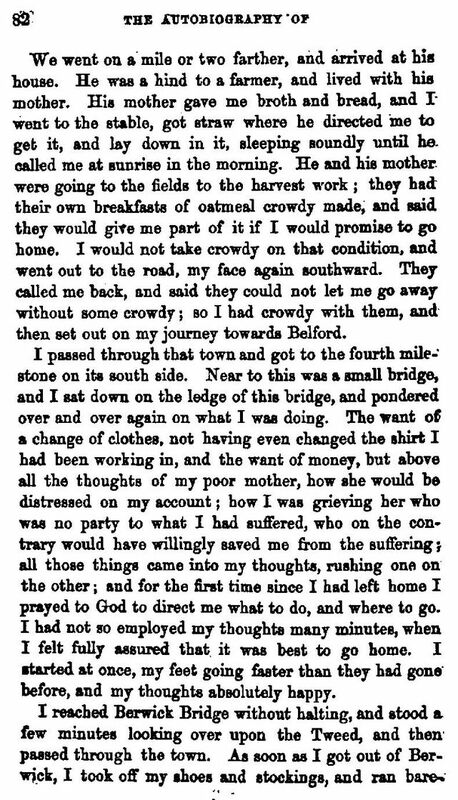 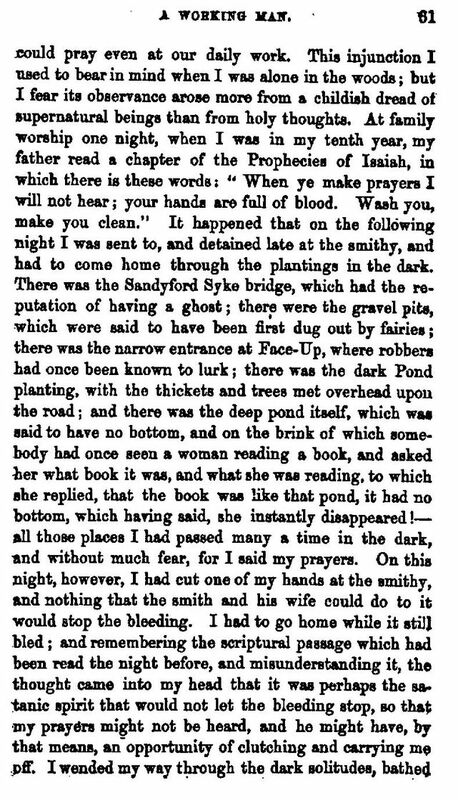 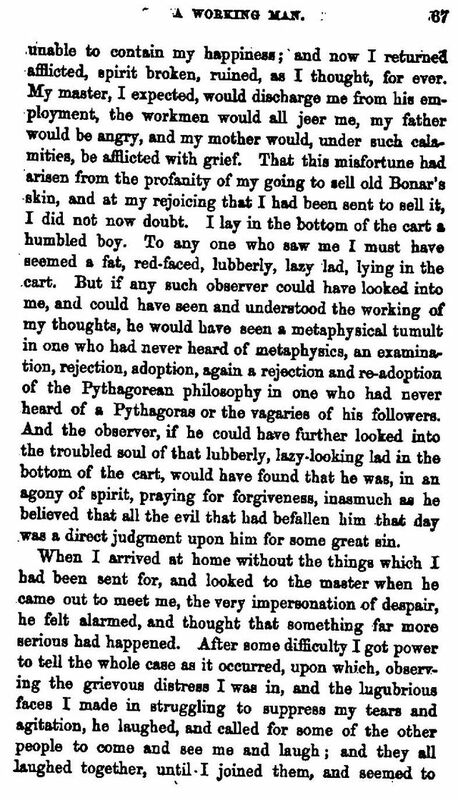 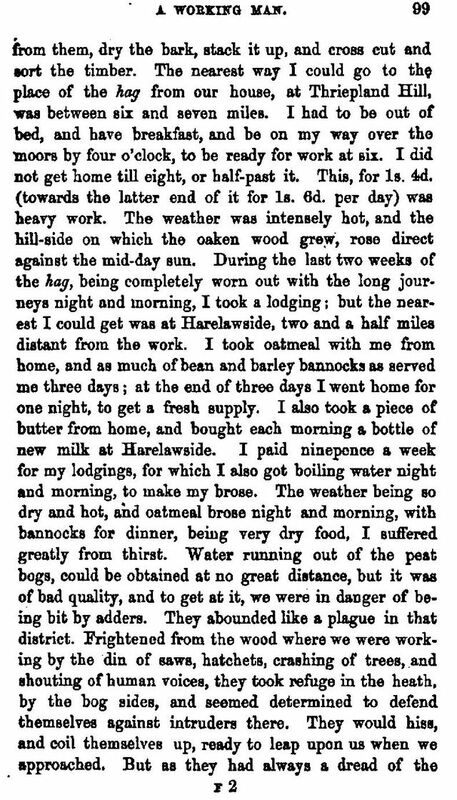 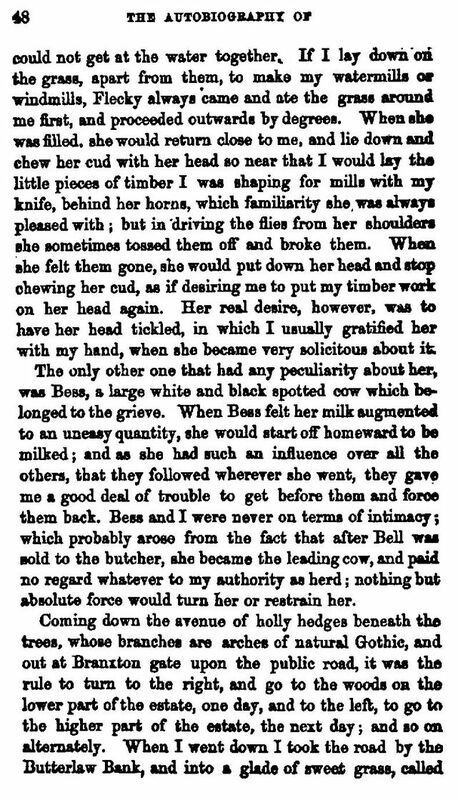 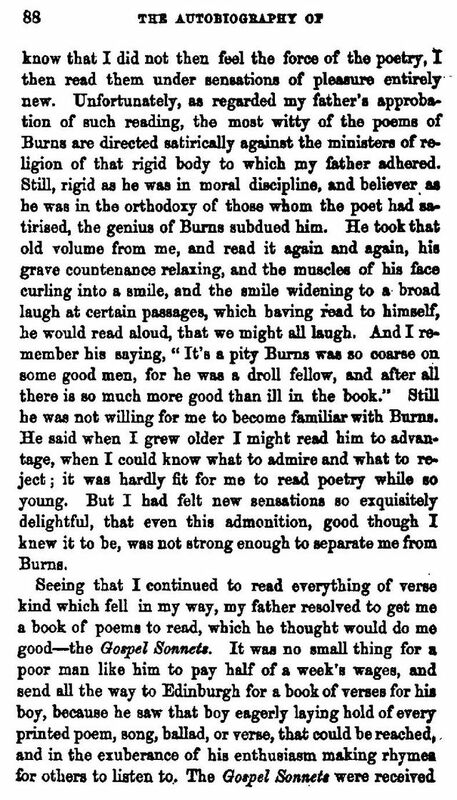 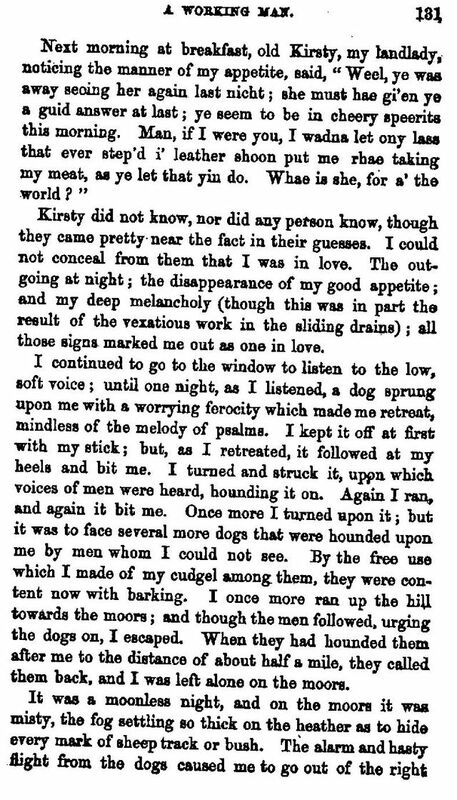 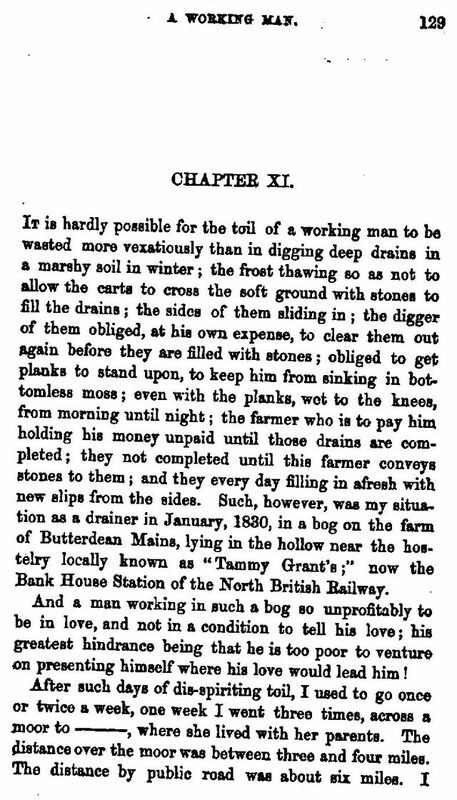 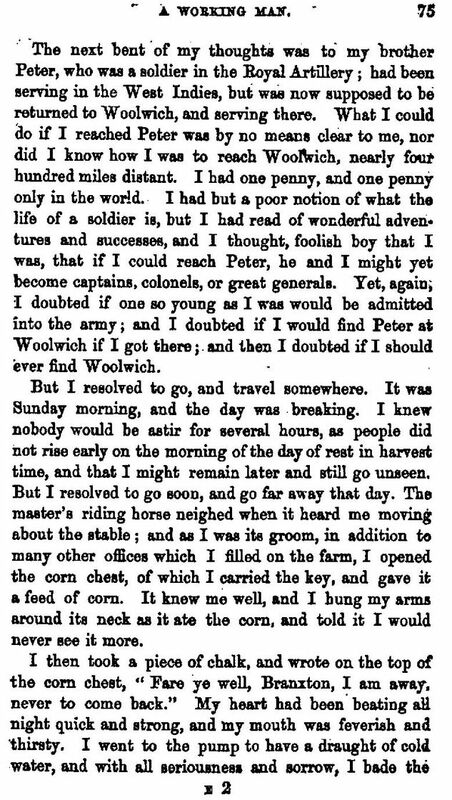 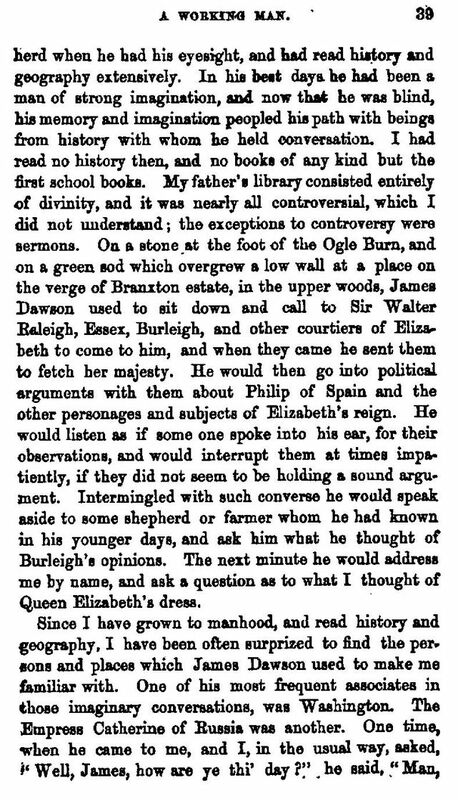 Published in 1848, Autobiography of a Working Man who has Whistled behind the Plough is in the nature of a minor classic, written in a remarkably modern and readable style, considering that its author received only the rudimentary education on offer in the village schools of his day. 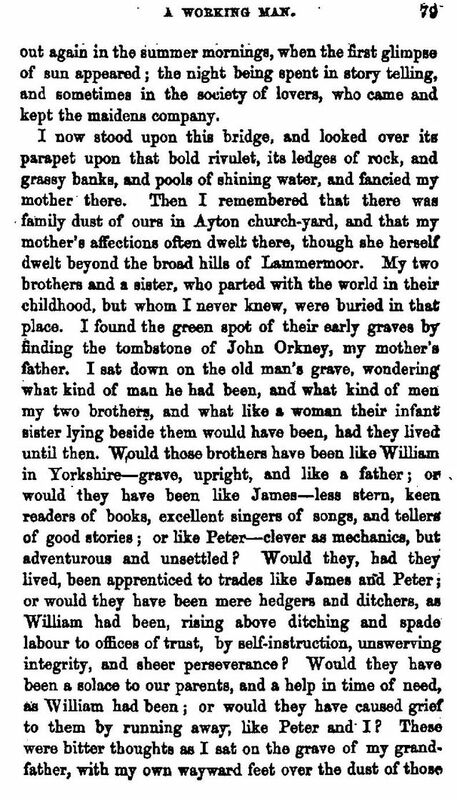 Somerville's father was born in the parish of Muckart in 1760; his mother came from Ayton, Berwickshire and had the unusual maiden name of Orkney, a name still to be found in the local churchyard today. 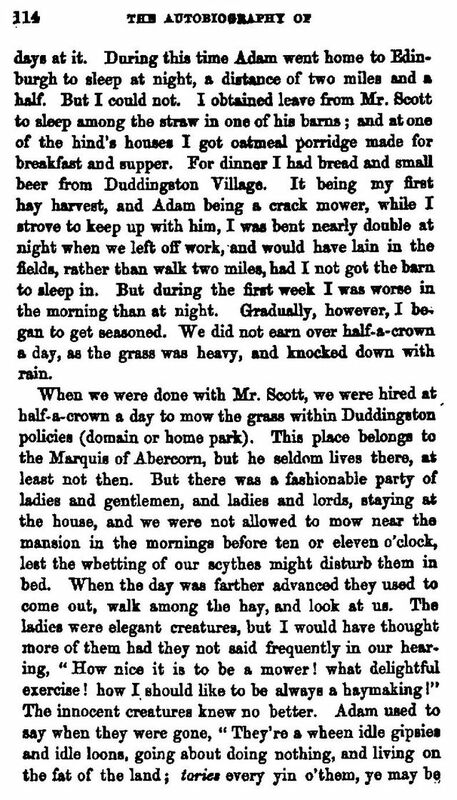 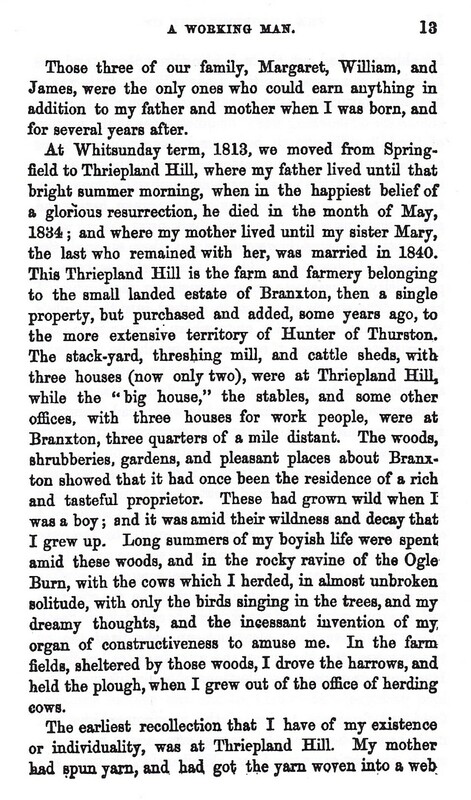 Alexander's family lived and worked on various farms including the Cove, near Cockburnspath, Thorntonloch, Thurston Mains, Springfield, Dunglass and Branxton. 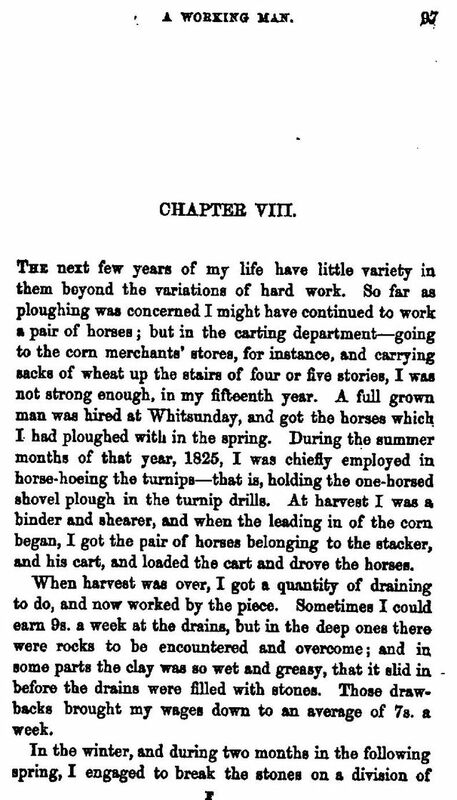 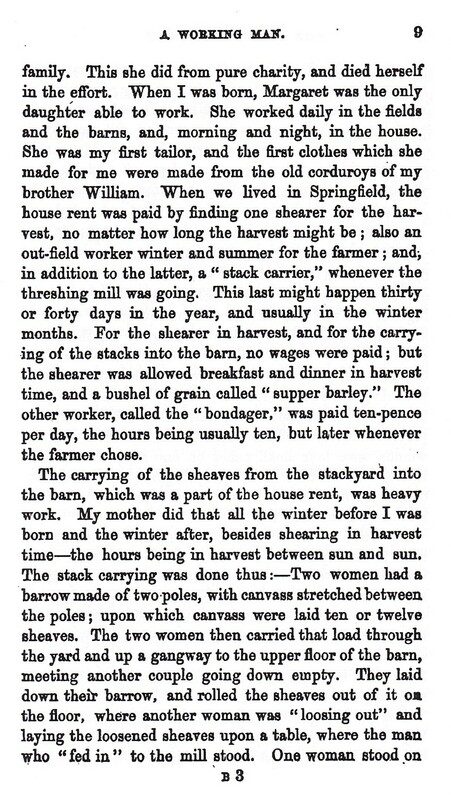 Somerville senior was a 'barn man' or thresher of grain; apart from son Alexander, all his children worked on farms in the vicinity during their lives. 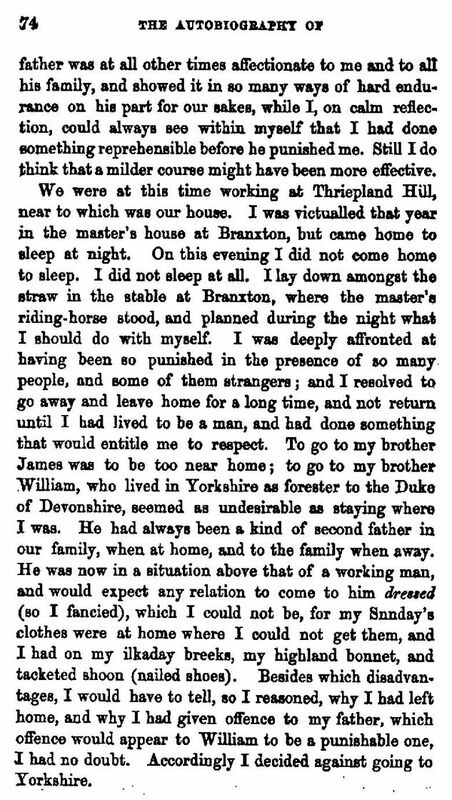 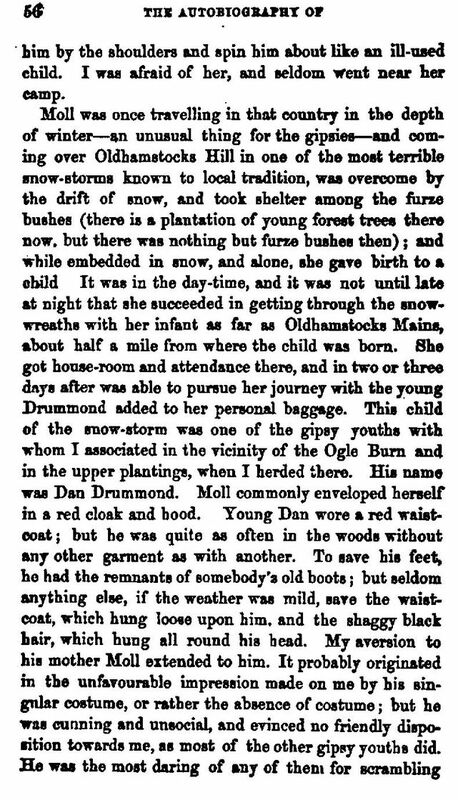 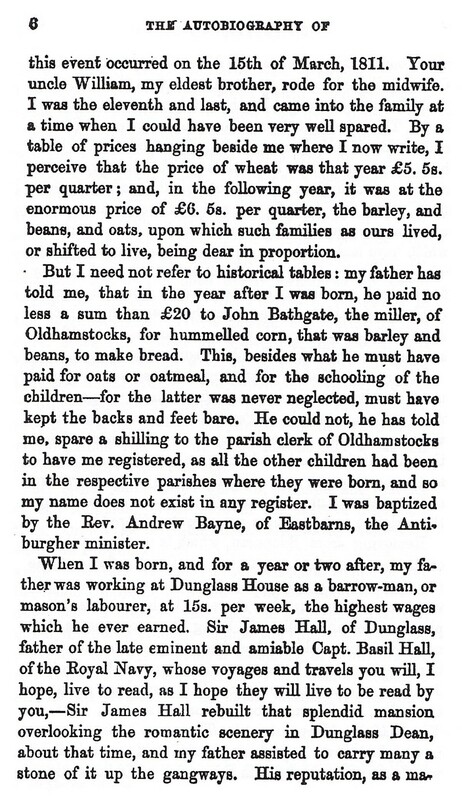 Alexander was born in Oldhamstocks, near Stenton, in 1811. 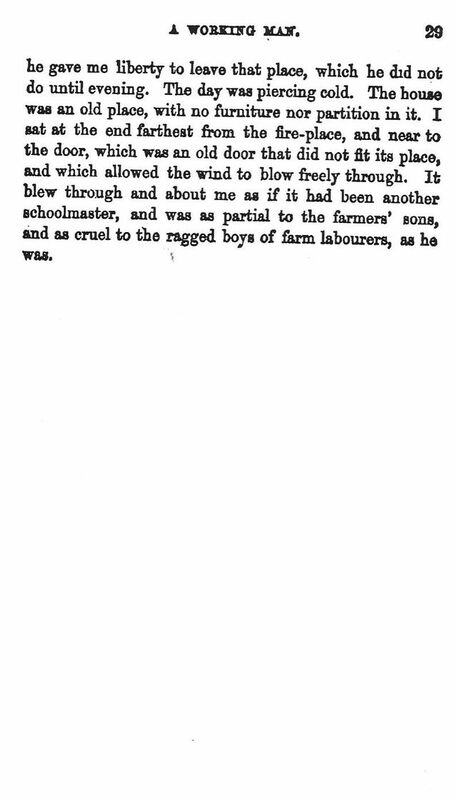 On leaving school at age fourteen, he worked on the farms mentioned above. 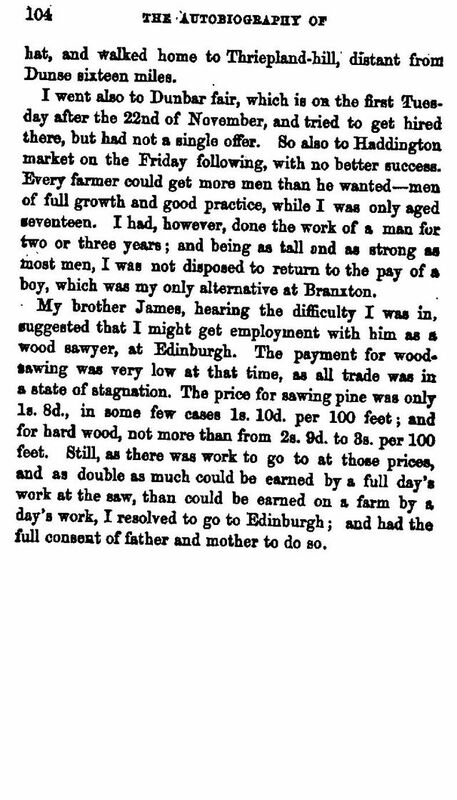 He tried to better himself in other occupations and wanted to become a forester but lacked the necessary qualifications. 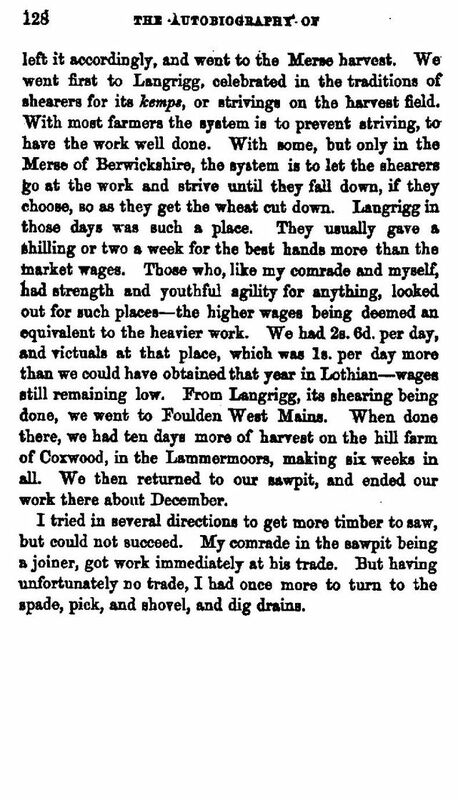 His autobiography is a story of his life as farm labourer, lumberjack, ditch-digger and sawmill worker. 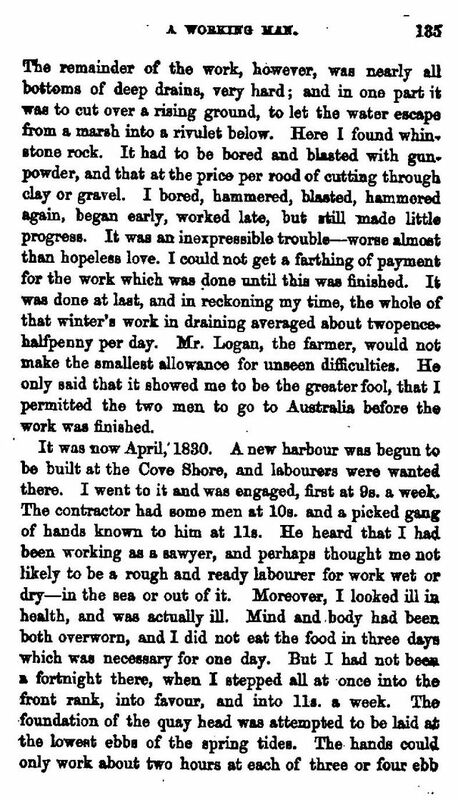 He also worked as a labourer on the construction of Cove Harbour, then the Skateraw limekiln, the last being a particularly dirty, smoky and back-breaking job. 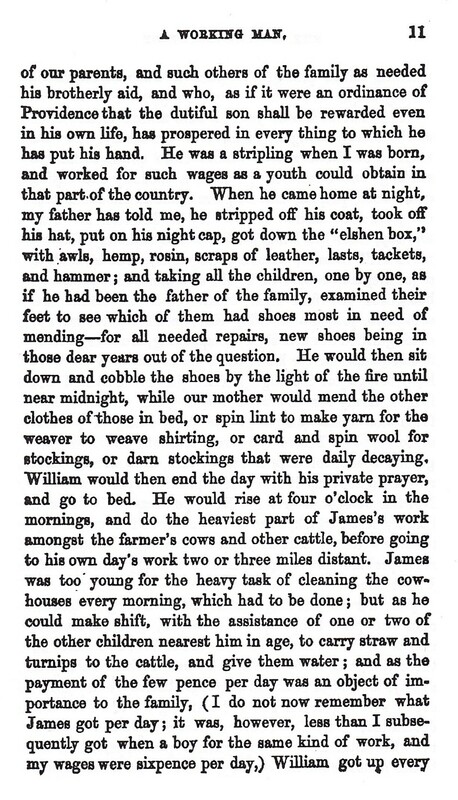 His day at Skateraw began at about 3am or 4am and he did not return home until 5pm or 6pm, depending on the season. 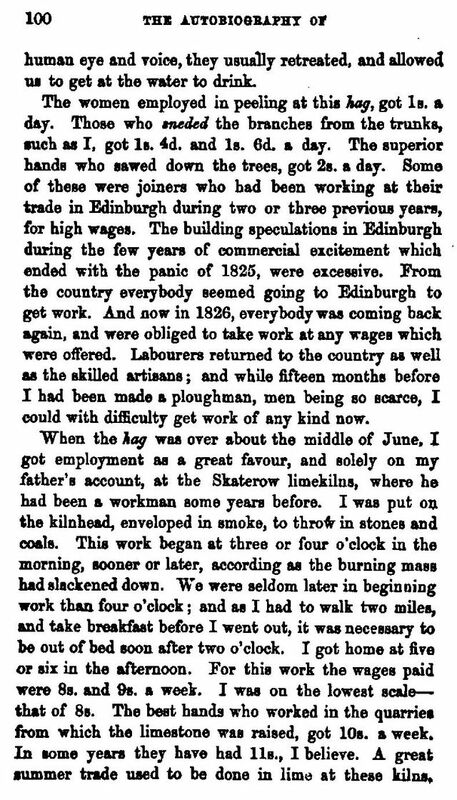 His weekly wage at Skateraw was nine shillings (45p) a week, poor when compared with a collier's wage of twenty seven shillings (£1.35) or a miner's of twelve shillings (60p) a week. 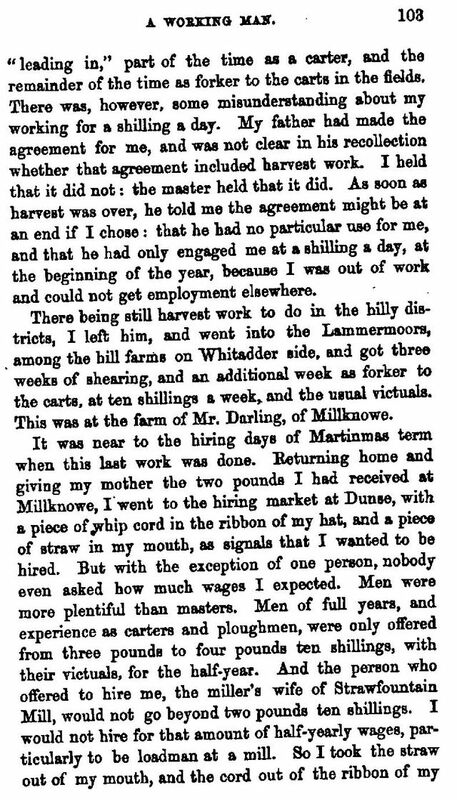 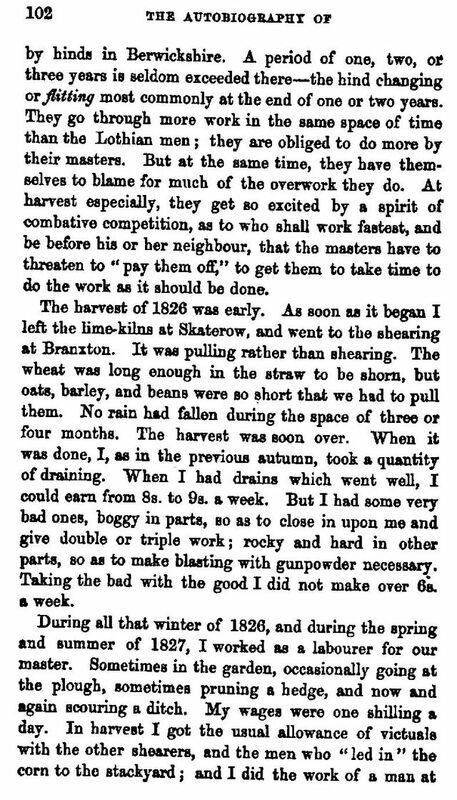 Tiring of the dirty, unhealthy job at Skateraw, Alexander went back to farm labour, pulling oats and barley, peas, beans, shearing sheep, ploughing and pruning hedges for even less money- six shillings (30p) a week, although the work was more healthy. 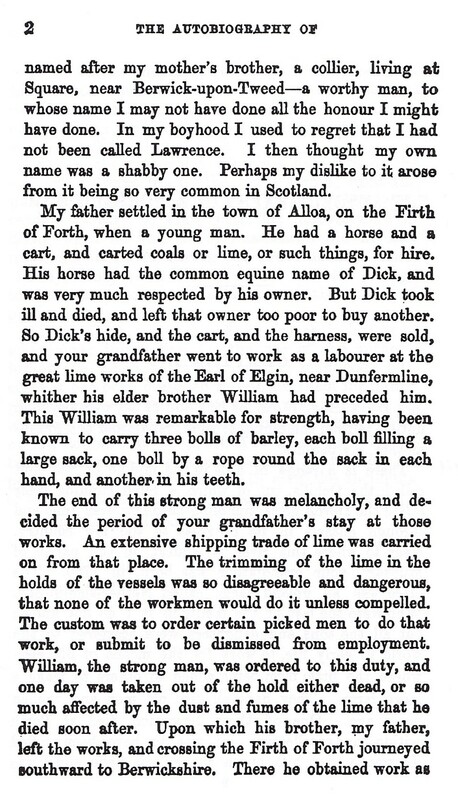 In 1831, after working on farms as far afield as Blinkbonny in Midlothian, Alexander decided to enlist in the regular army, joining the Royal North British Dragoons (The Scots Greys, the first regiment of dragoon cavalry formed in the second half of the seventeenth century by General Tam Dalyell of the Binns in West Lothian. 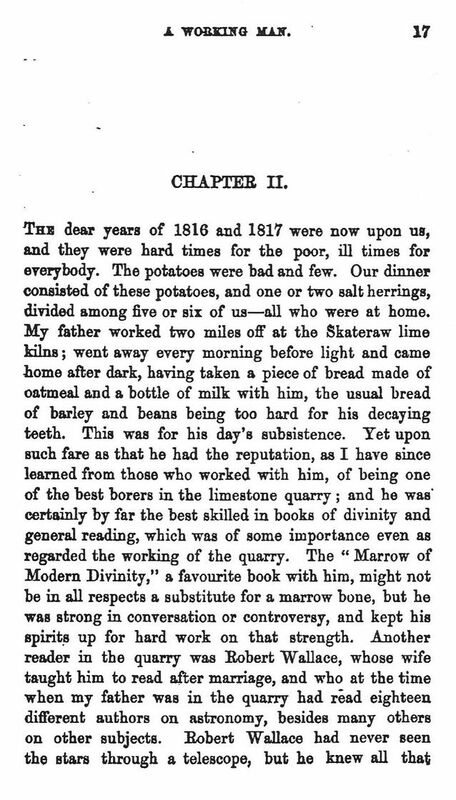 Life as a trooper in the Greys was reasonably good, especially the daily diet. 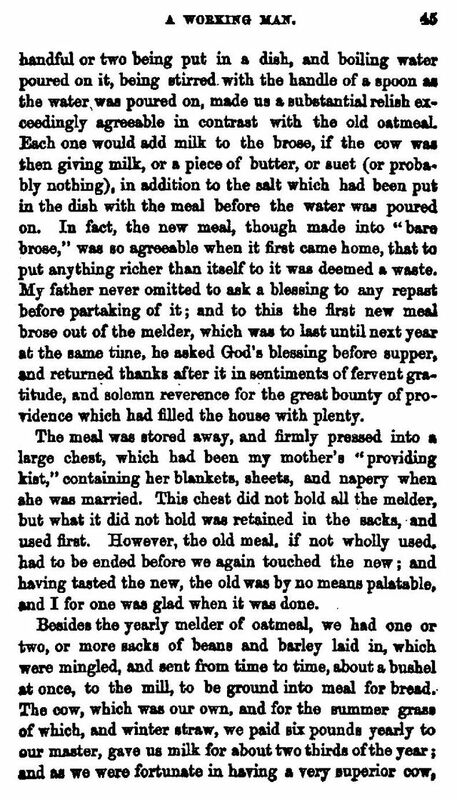 Somerville enjoys roast goose and roast meat with Yorkshire puddings for the first time in his life! 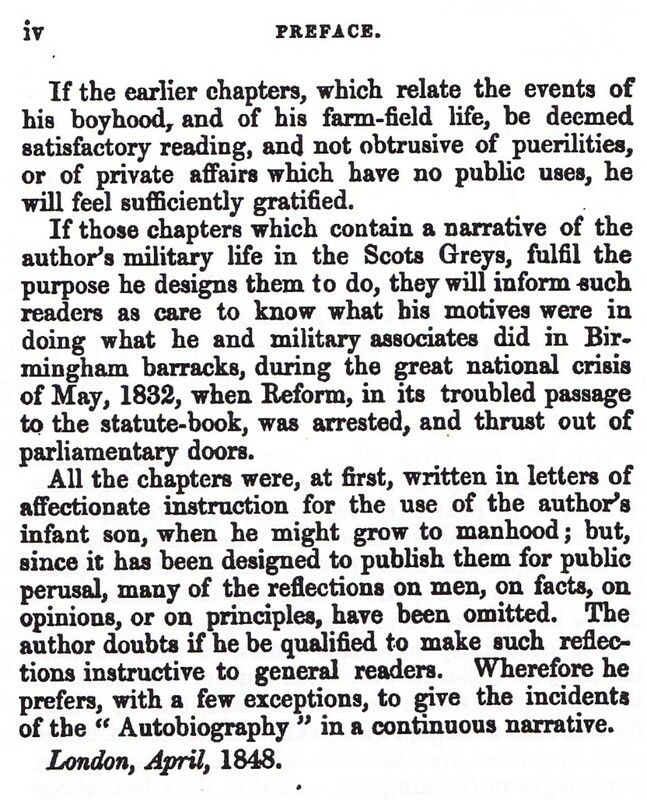 However, he fell foul of the military establishment by writing letters to a Birmingham newspaper criticising the Duke of Wellington who opposed the great Reform Bill of 1831 during its passage through the Houses of Parliament. 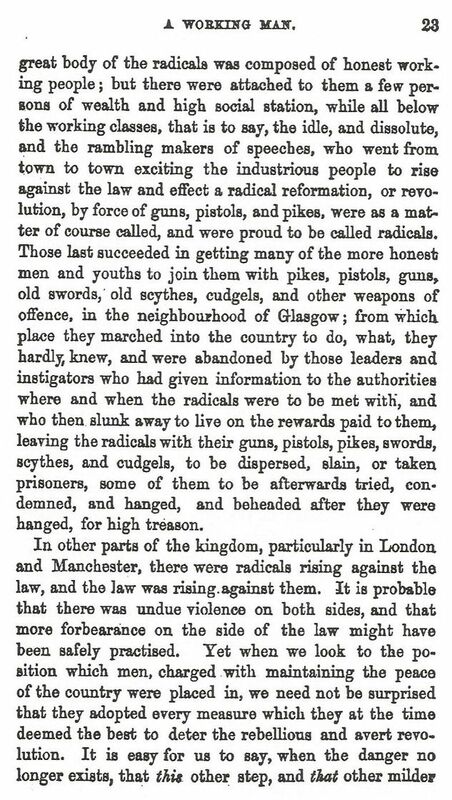 The Bill would enfranchise considerably more men than before, allowing votes to those who had been denied the right for centuries and ending the corrupt and rotten boroughs in England. 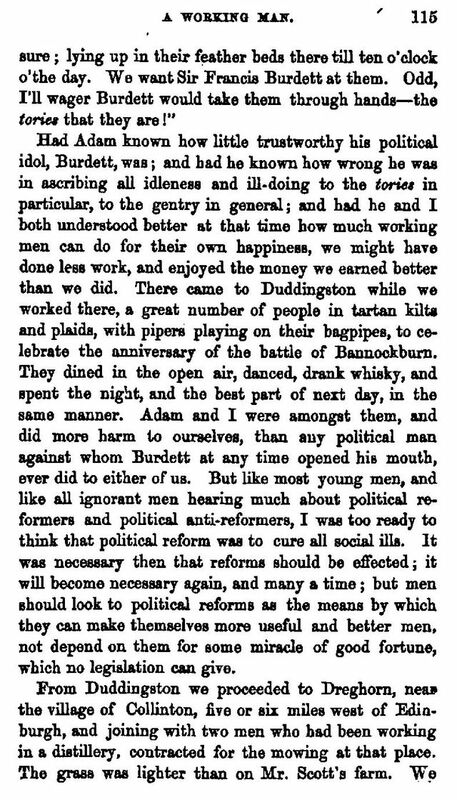 Somerville was a great champion of democracy and he was incensed when his regiment was ordered to disperse the 'mobs' demonstrating in support of the new Bill. 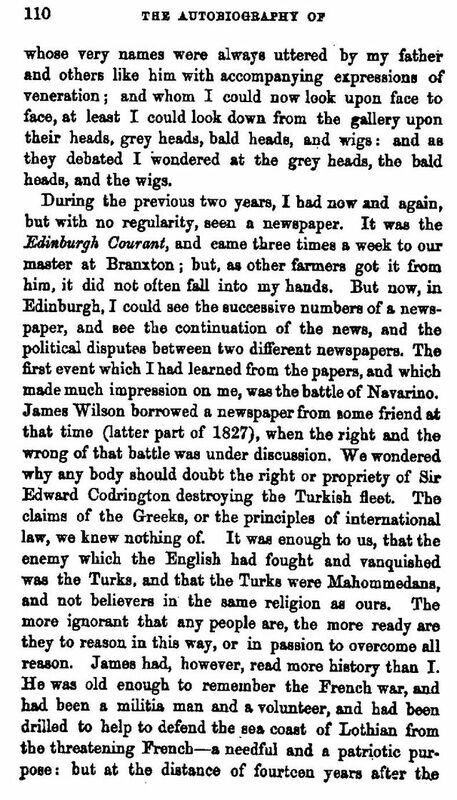 His campaign was noted and he was sentenced to 200 lashes for his contumacy in attacking the Duke of Wellington in print. 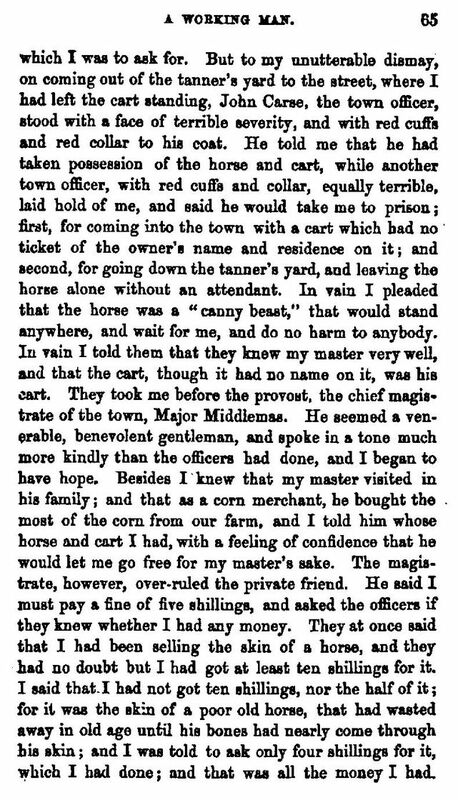 He received only half that number. 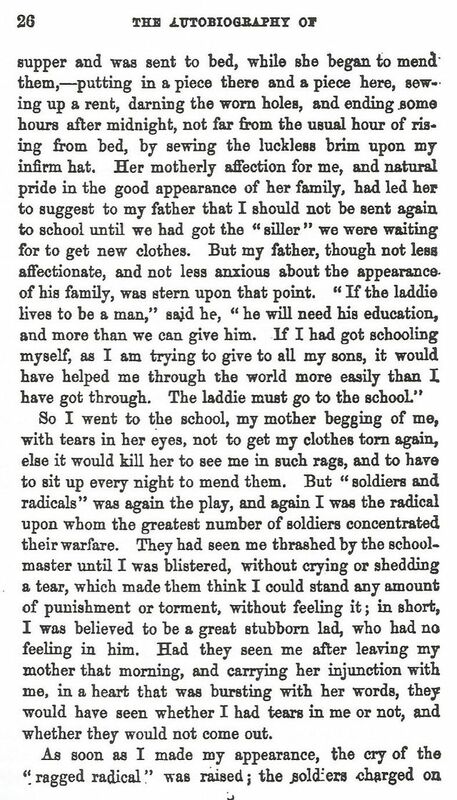 (Corporal punishment in the British Army would not be abolished until 1881, under the Cardwell reforms.).. 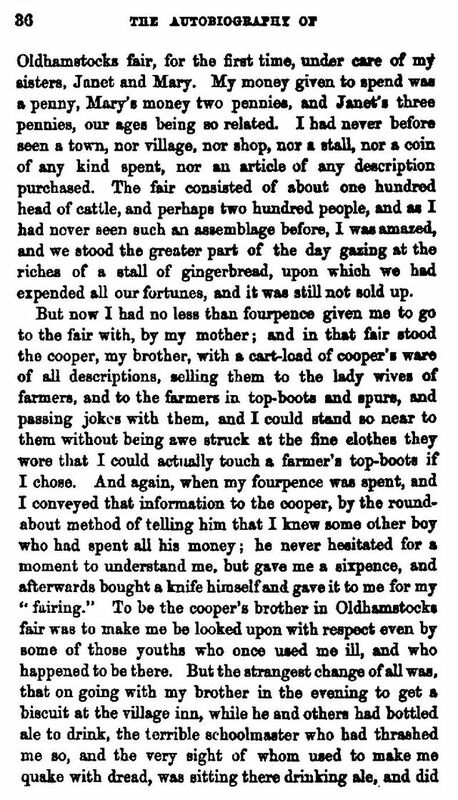 An independent newspaper took up Somerville's case and raided £320 in his support; he spent £30 of it to buy himself out of the army. 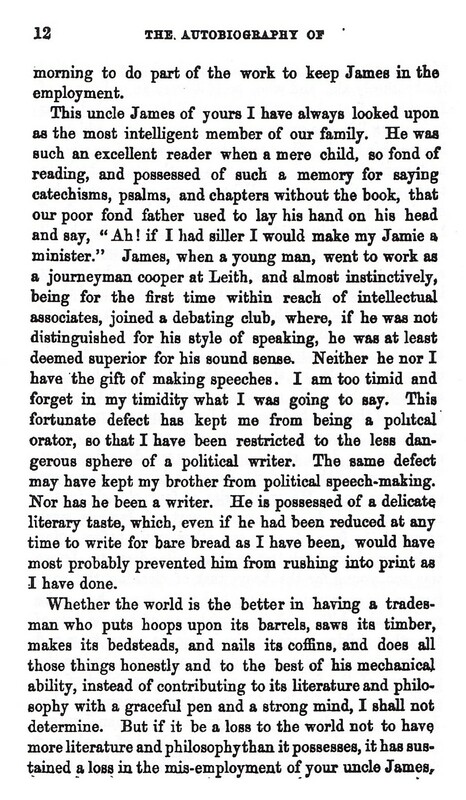 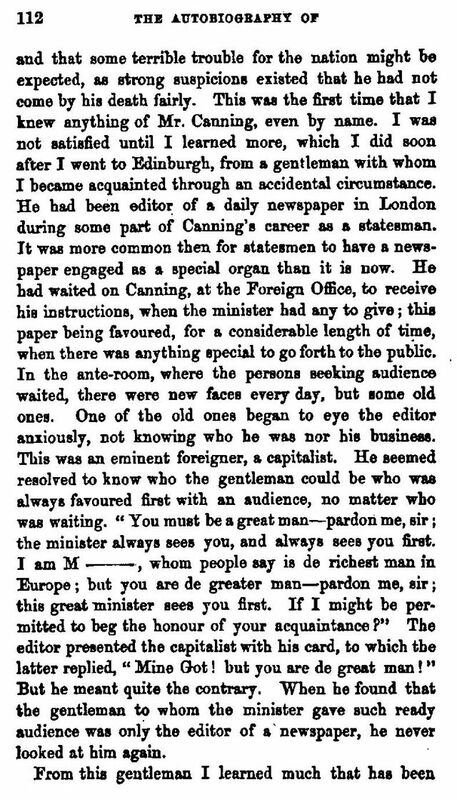 Sadly, through unwise investments and failed projects, Somerville lost most of his wealth; at least he found his metier as a writer and journalist, a profession for which he was eminently qualified. 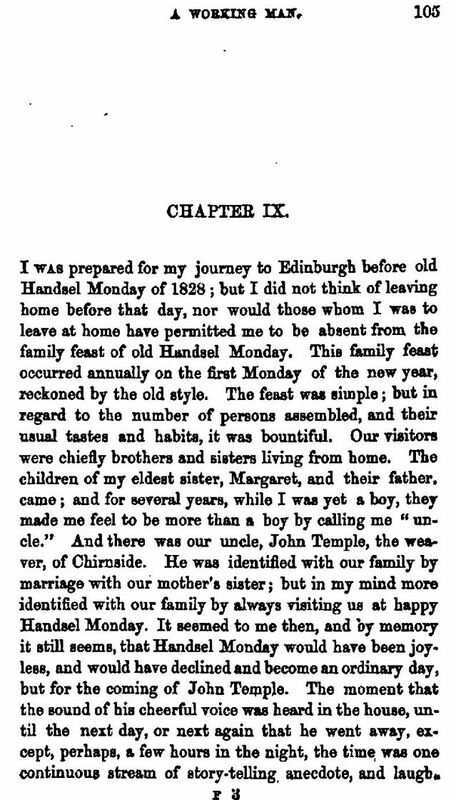 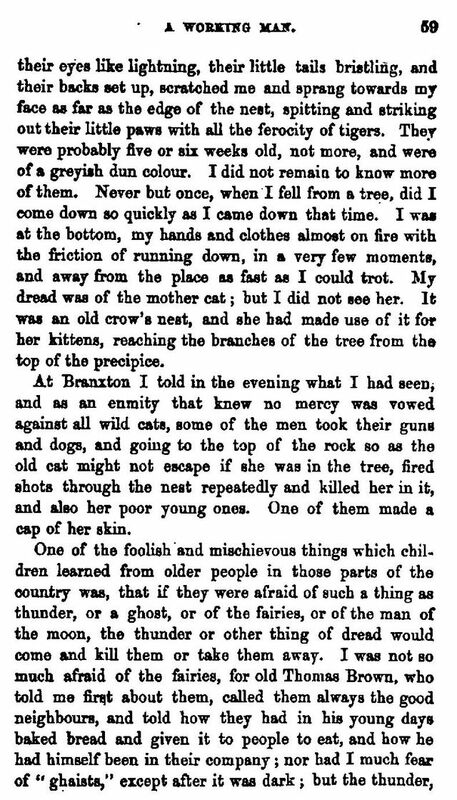 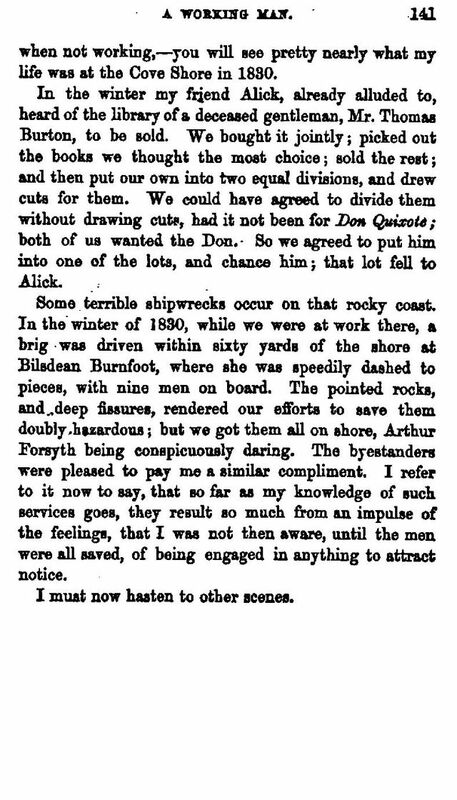 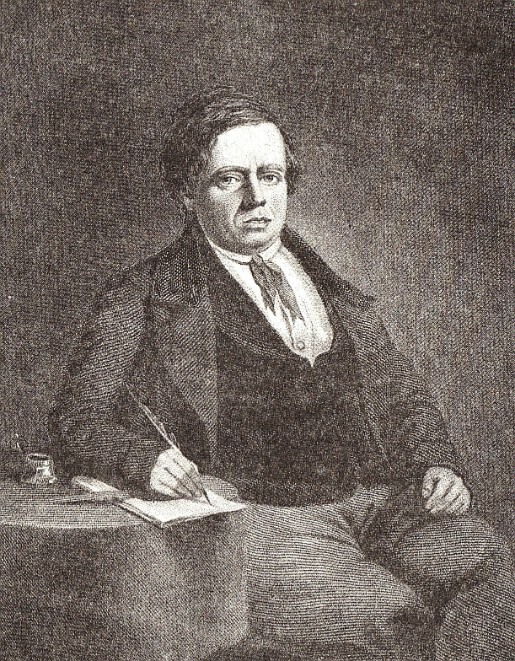 Between 1837 and 1848, Somerville published several books. 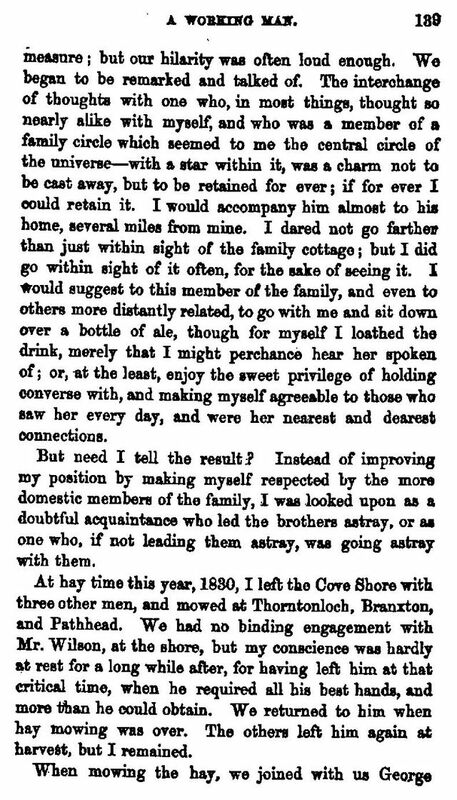 He married in 1841 and after several years scraping an existence, emigrated to Canada with his wife, who died shortly afterwards in 1853. 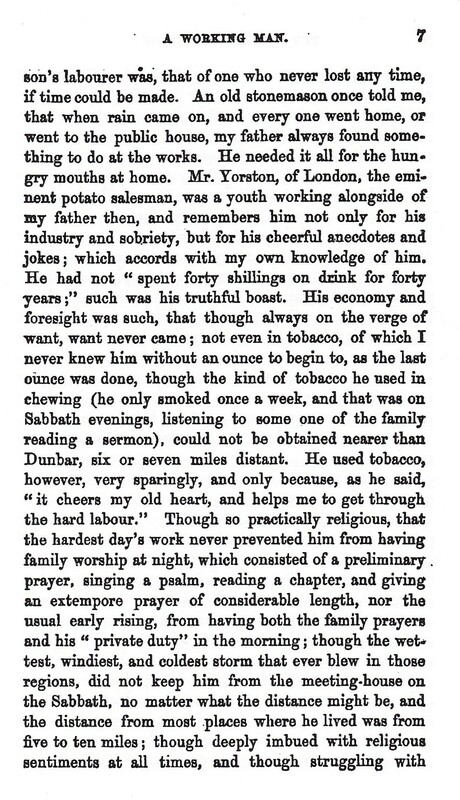 He found employment as editor of the Canadian Illustrated News but his health and finances were in poor shape. 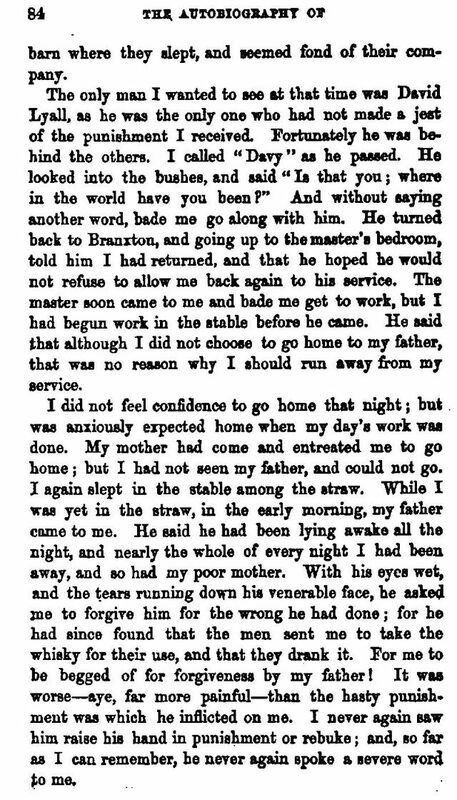 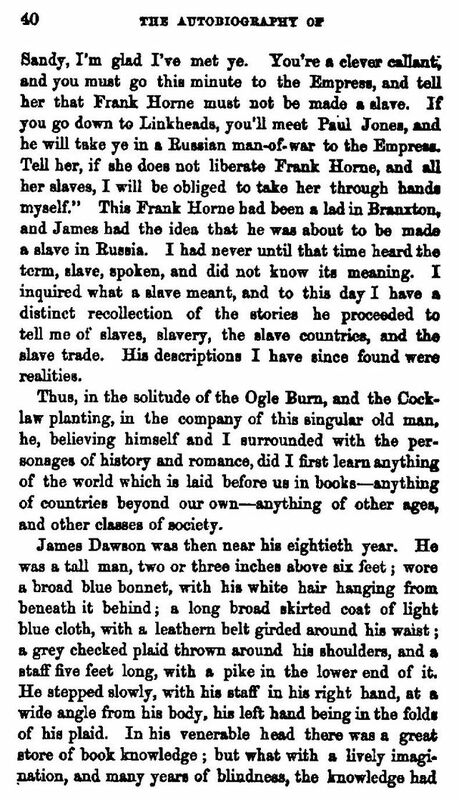 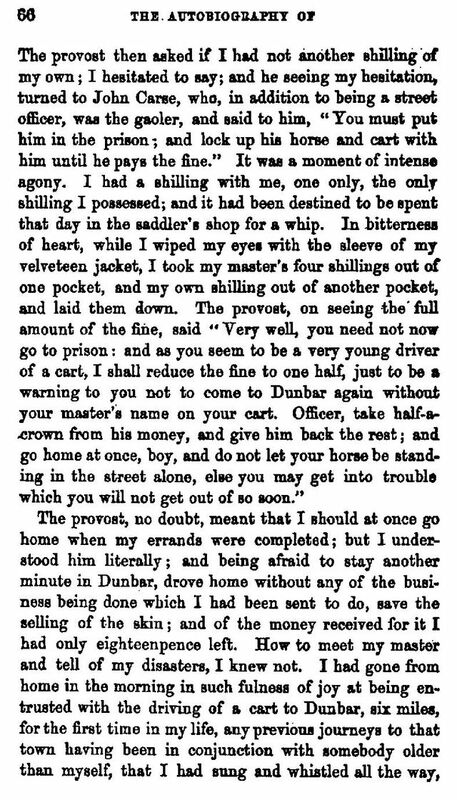 Alexander Somerville, a homeless vagrant was found dead in a shed in Toronto in 1885. 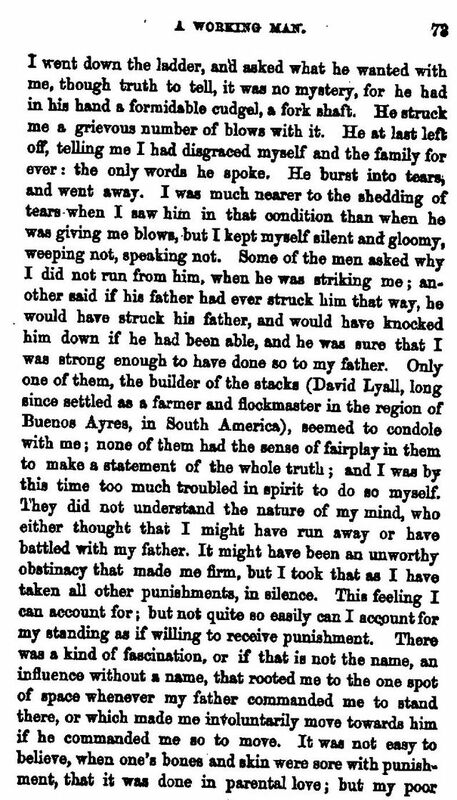 He was survived by his only child. 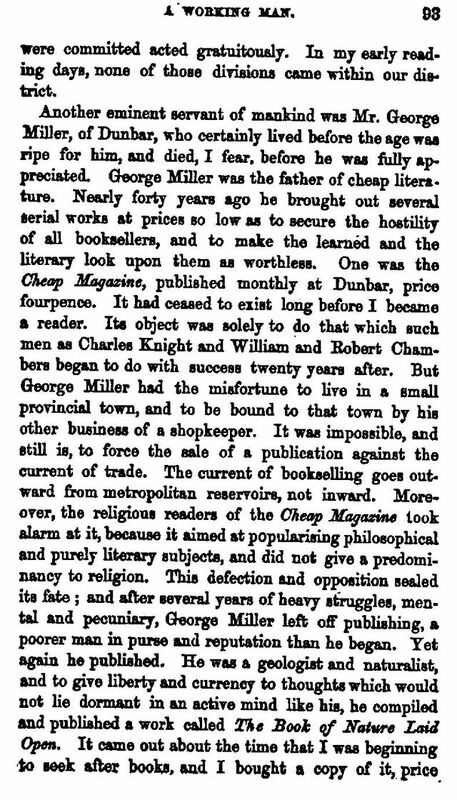 It was a sad end for a man who possessed considerable literary skills and who believed in democracy, justice and the rights of the common working man. 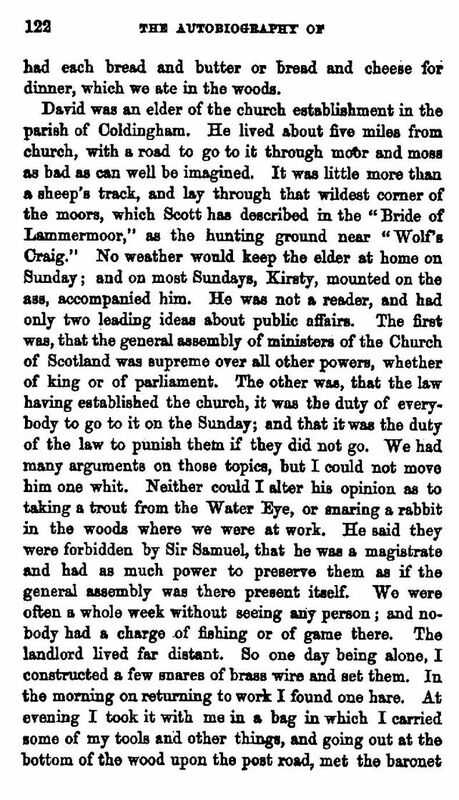 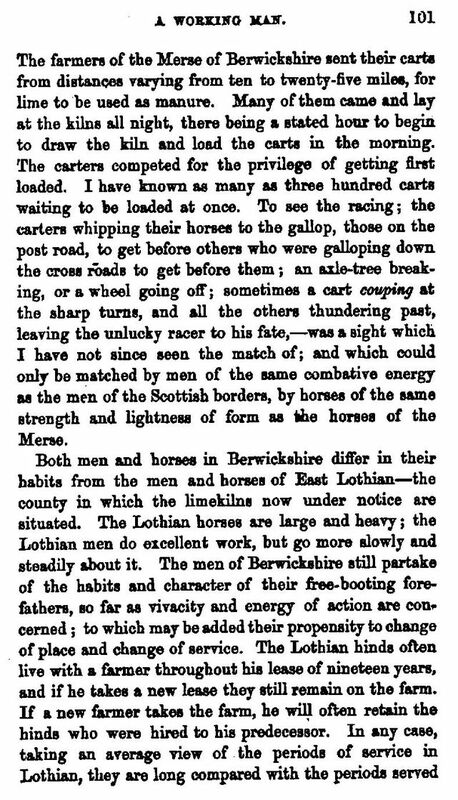 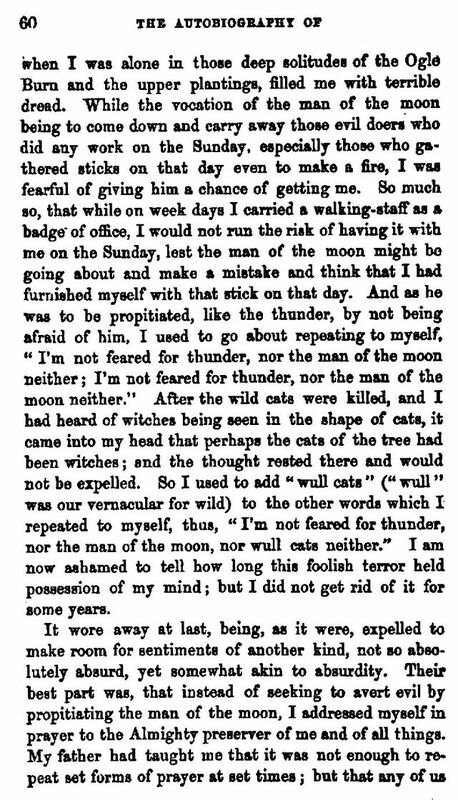 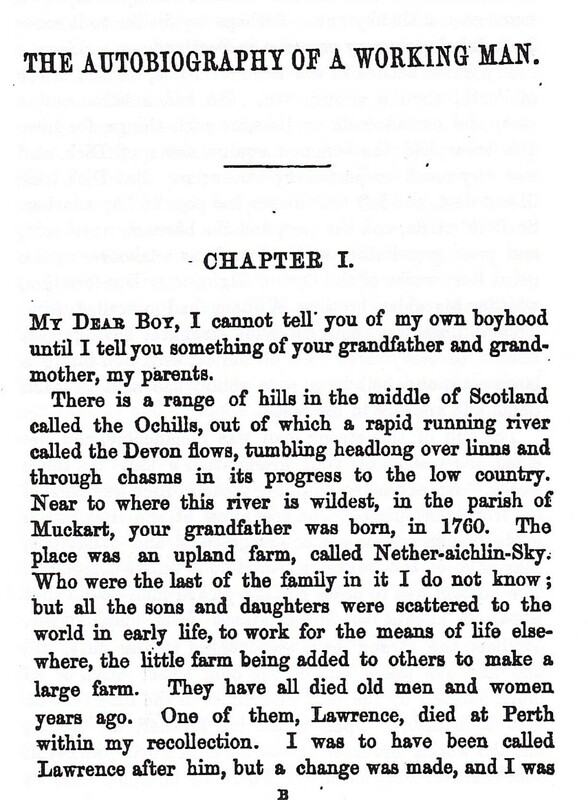 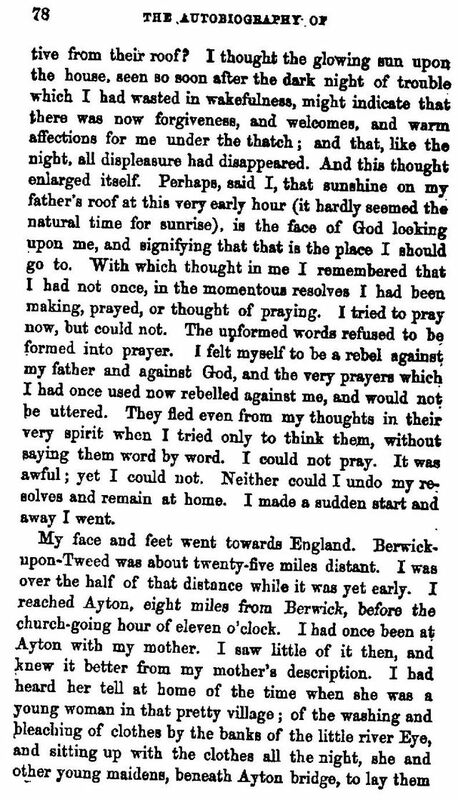 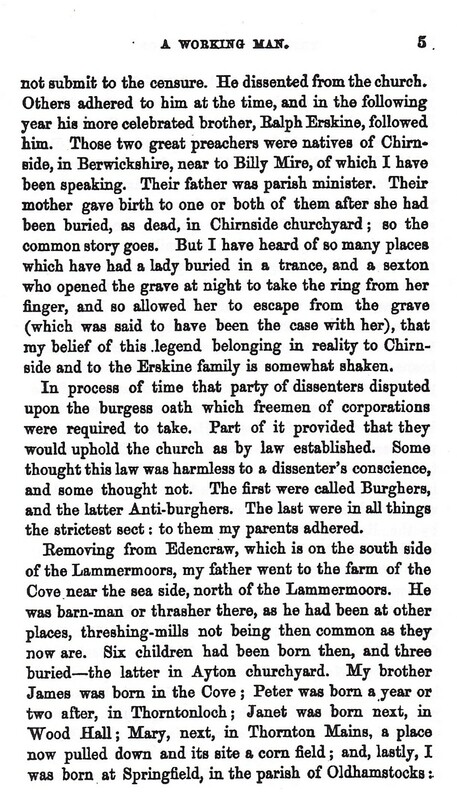 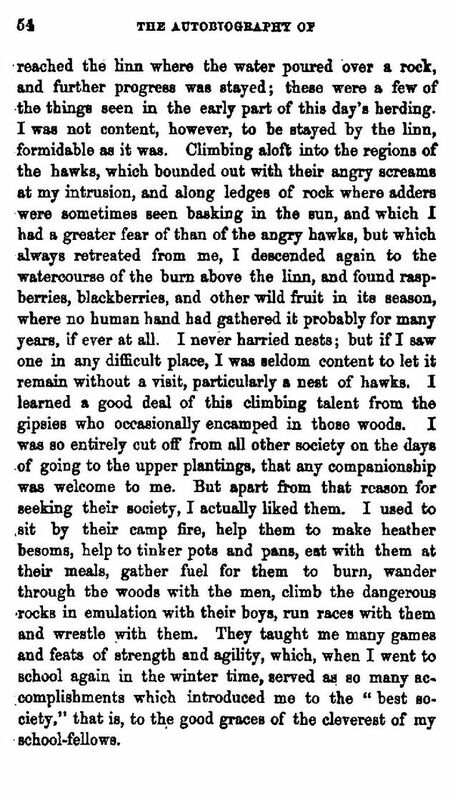 For anyone wishing to continue Alexander Somerville's story following his time in Dunbar and Berwickshire, reprints of the book are widely available.